Tuesday, May 7th is Teacher Appreciation Day. 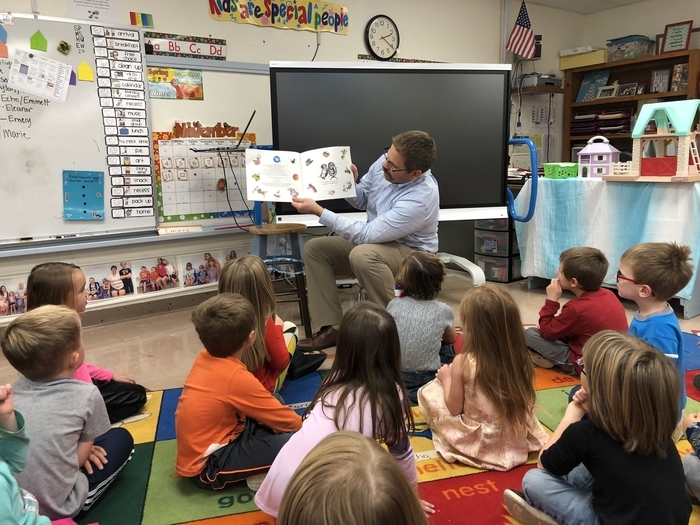 We are extremely thankful for the wonderful teachers we have in our district and will be celebrating them the week of May 6th through May 10th. Wednesday, May 8th is National School Nurse Day, so please take time to thank our school nurse for all she does for our students. Wednesday, April 24th is Administrative Professionals Day, so please take time to thank all of our district secretaries, administrative assistants and other office professionals for making USD 322 great! 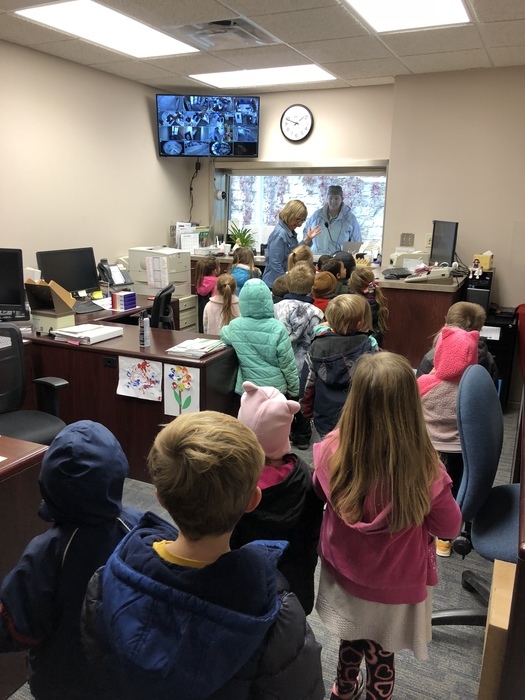 Tuesday, April 23rd is National Bus Driver's Day, so please take time to thank our district bus drivers for doing a great job and keeping our children safe! 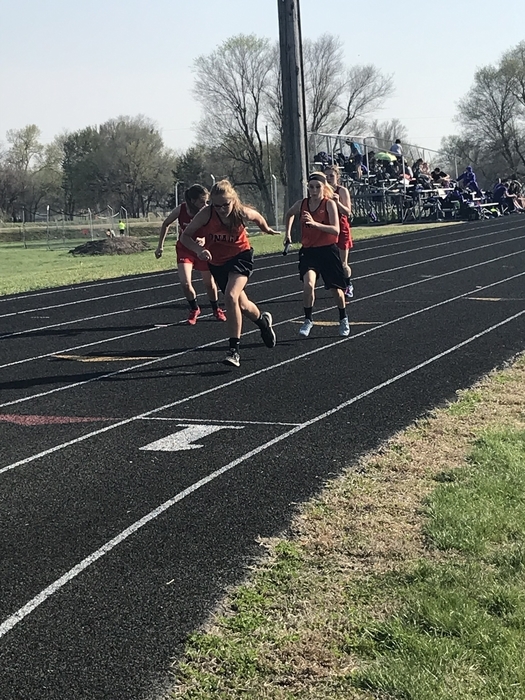 OJH track athletes have been working hard and competing the past couple weeks. Below are some snapshots of our athletes in action. 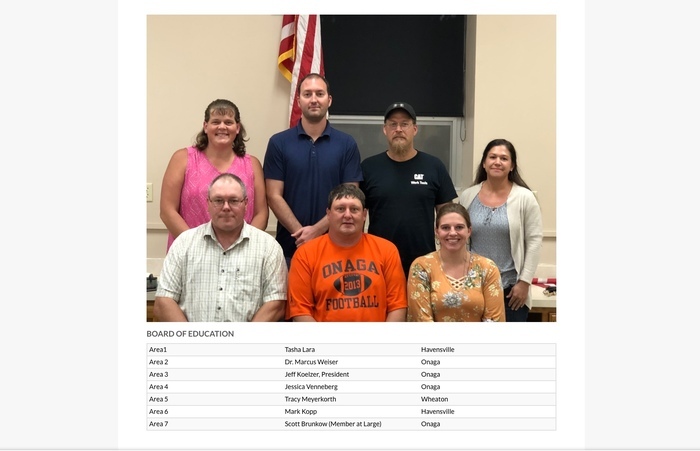 Driver's education will be offered in Onaga this summer. Students must be 14 by May 29 and entering 9th grade in the fall. Many more details to be announced...stay tuned. 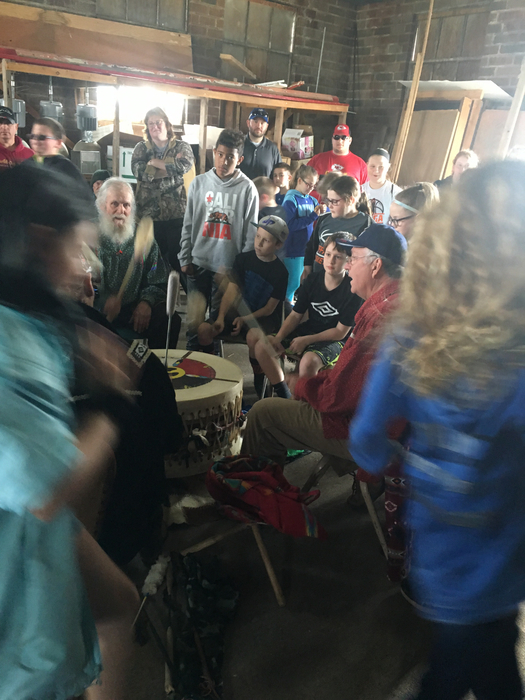 Last day of KRR After School Program for this school year is May 2. 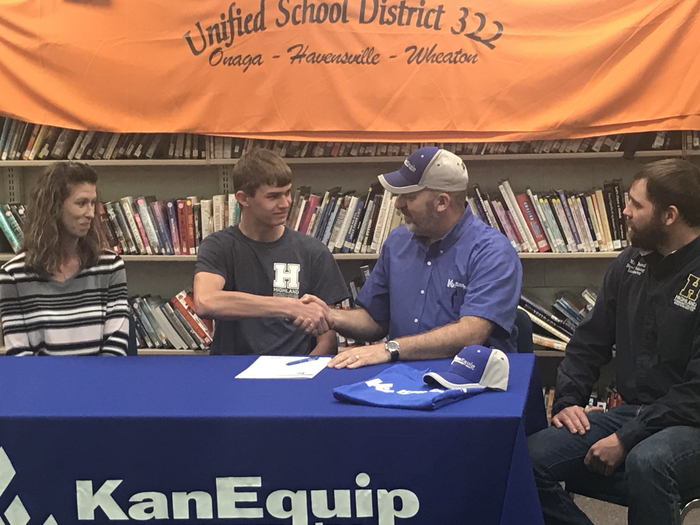 Senior Aaron Schwartz was awarded an Ag Technician Scholarship from KanEquip. Congratulations Aaron!! 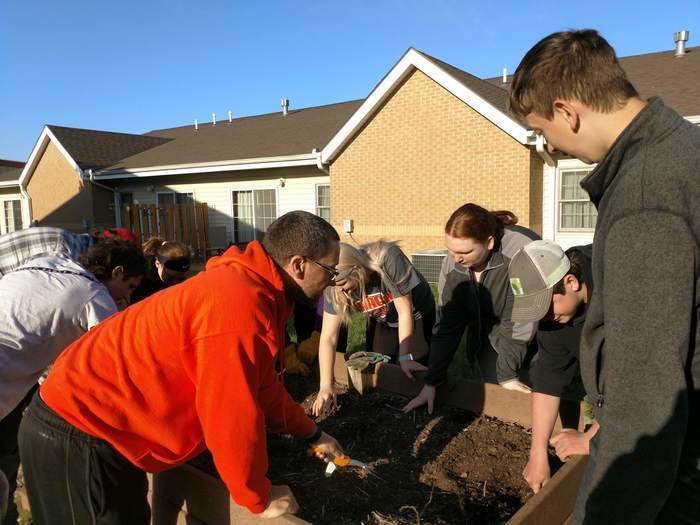 This morning Mrs. Kocher’s 1st hour Algebra 1 class went up to Redbud Assisted Living to help the residents get ready for Spring planting. 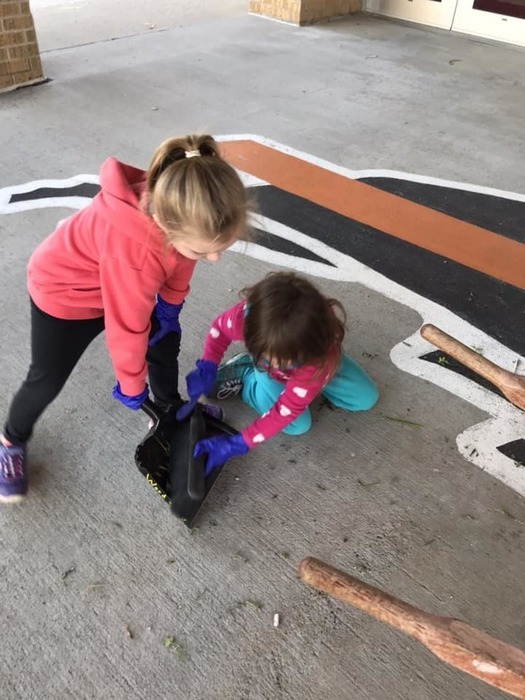 We helped pull weeds and rake and gather leaves. We did a very good job at exhibiting Habit #6, Synergize. Posted by Clayton Szel. 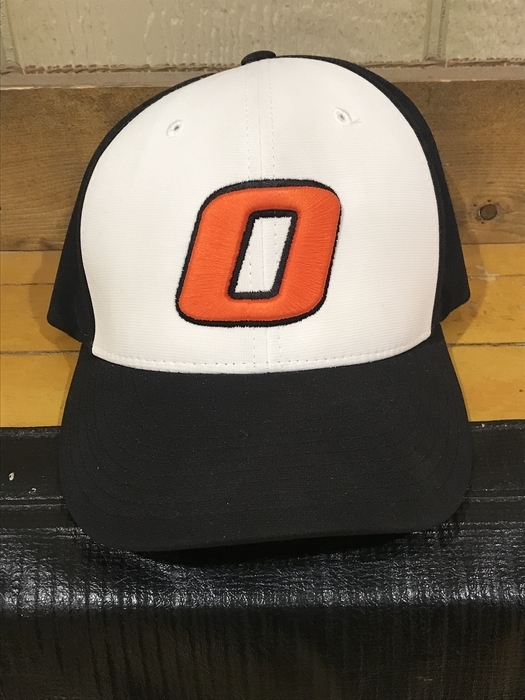 Onaga Baseball team falls to Mission Valley in the double-header 0-10 and 0-6. Lots of improvement shown tonight. 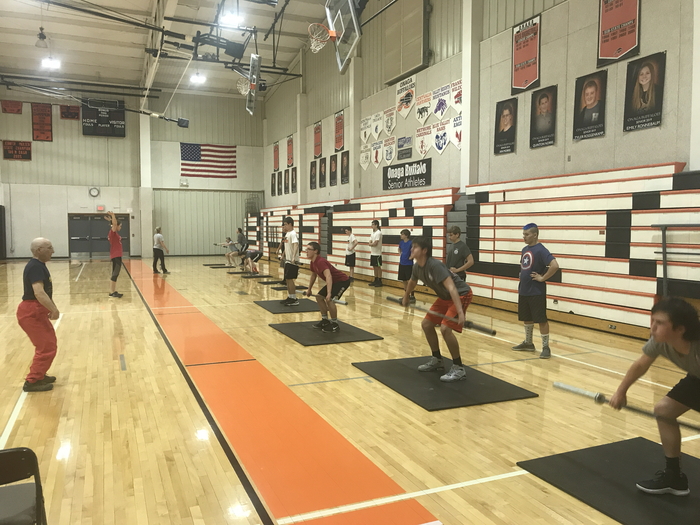 The boys continue to get better. 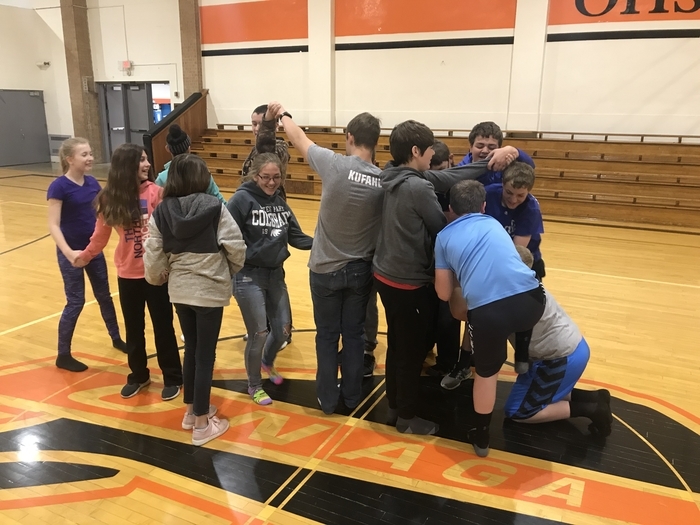 The Jr. High Leader in Me class practiced teamwork, critical thinking and problem solving skills untying the human knot! 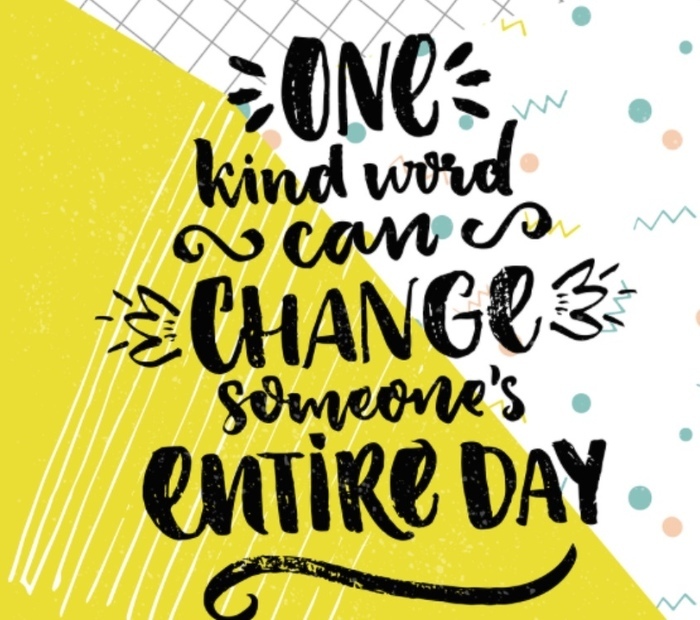 Another gentle reminder for ordering 2018-2019 yearbooks! 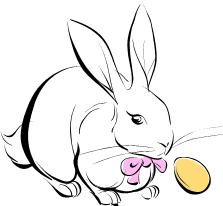 OHS KAY club Easter Egg Hunt will be held at Leisure Land Park Saturday, April 13 at 10 a.m. Children ages 0-10 are welcome! Please bring your own basket or bag. The Easter bunny will be present for pictures if you wish. Hope to see you there! 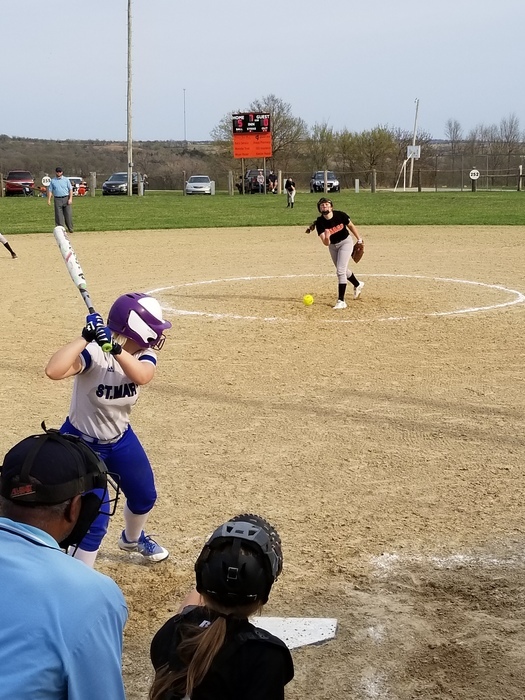 The Onaga softball team won both games against St. Marys tonight, extending its winning streak to four games. 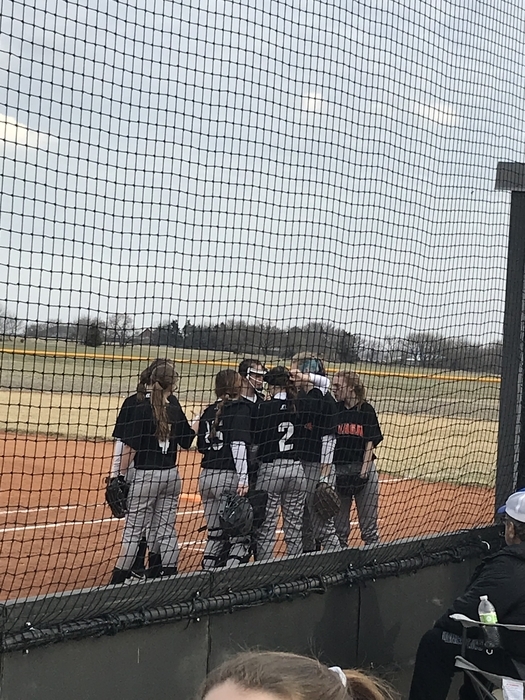 Harley Smith pitched a complete game shutout in a 5-0 win, then Morghan Owens pitched four shutout innings in a 16-0 run-rule in game two. Softball wins the opener 5-0. Hustle out to get supper and watch game 2!! Go Buffs!! Reminder that there is no school for kids on Wednesday, April 10. It is a professional development day for all staff. Thank you. 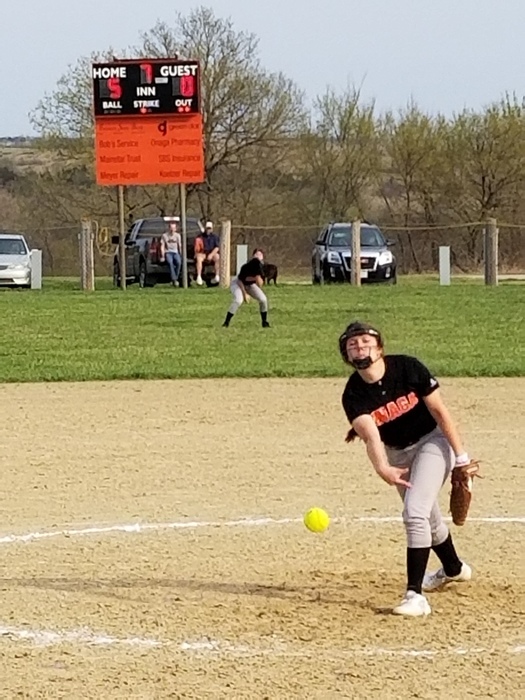 Onaga Softball gets its first “Run Rule” in history, beating Riley Co JV 11-0 in 5 innings. Harley Smith gets the W from the mound. 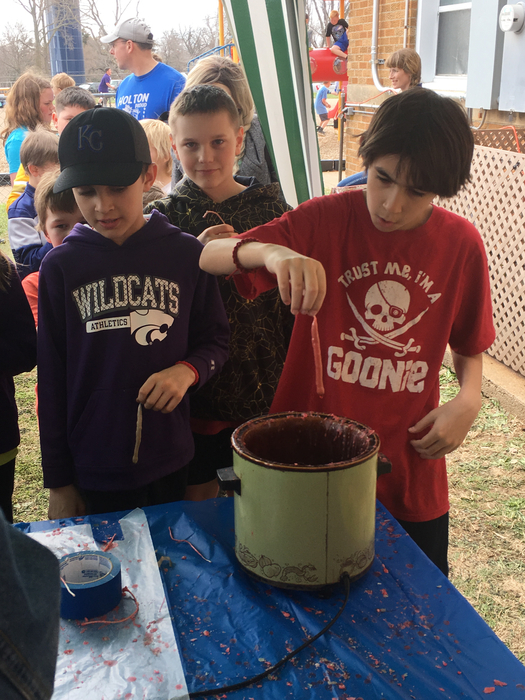 Some of USD 322 kids enjoying Havensville Living History Day. A men’s wedding ring was found near the softball field. It is in the high school office for the owner to claim. Thank you. Attention Parents of 9th - 12th graders: see the attached information from Mr. Koch regarding the process for ordering 2018-2019 yearbooks. Today, April 4, is National Librarian Day! Stop by the library and tell our wonderful and lovely librarian, Mrs. Bergman, how much you appreciate her working at our school. Posted by Lilly Carl. 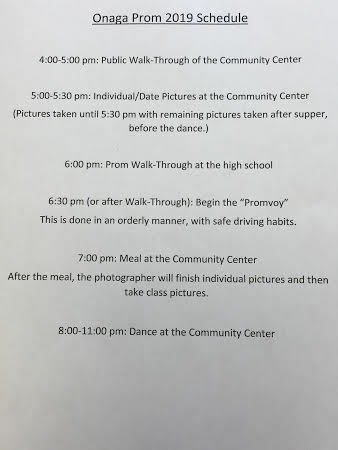 Did you know that prom is this Saturday April 6th? The festivities start with the Public Walk-Through at the Community Center from 4 to 5 pm. 6th Grade Leader of the Week (3/25-3/29) Angelique Smith "I use habit one Be Proactive by getting all my stuff done and turned in on time. I like this habit because I always know what's going on in my life." 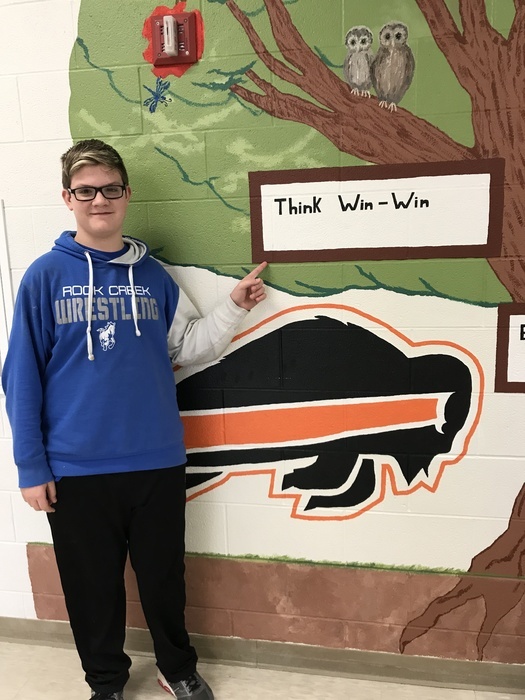 6th Grade Leader of the Week (3/25-3/29) Tad Szel "I like habit 6 Synergize. I like to be with others that I can work with under stress and help compromise arguments. Baseball team falls twice tonight in a double-header against Nemaha Central. Kaid Schwant crossed home plate for the first run in history. Marked improvements on display tonight, looking for more in the next 8 practices. 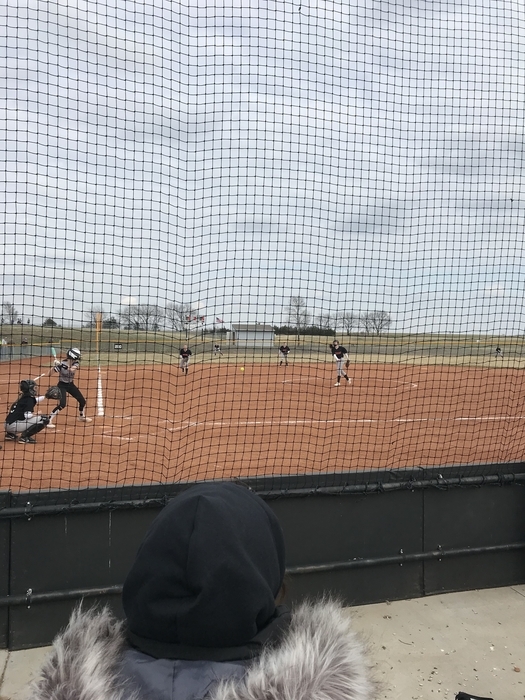 Come cheer on our softball and baseball teams in their first home meet! We are looking forward to shouting with you in the stands. Baseball & History lovers! 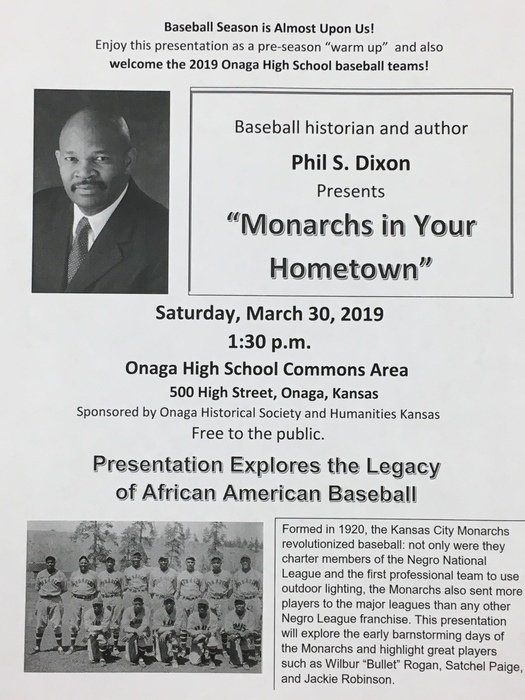 : Join us in the OHS Commons Area TOMORROW, 3.30.19 at 1:30pm, to learn the history of the Kansas City Monarchs Baseball Team & the Legacy of African American Baseball, being presented by baseball historian Mr. Phil S. Dixon. This is free to the public. 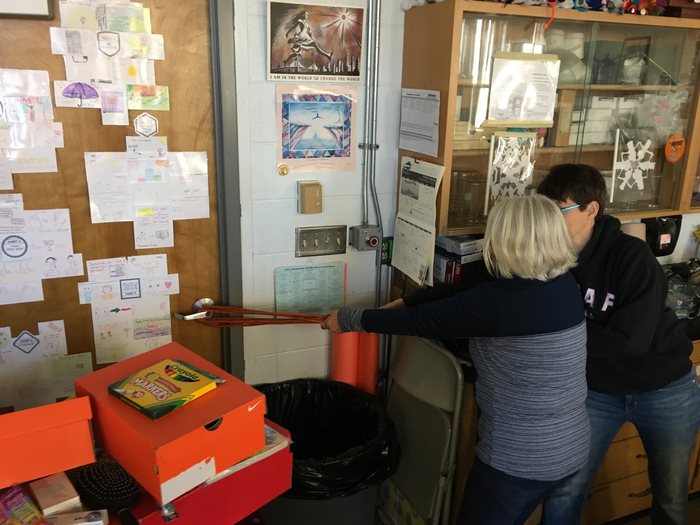 Did you know that there is a program called Crayola Color Cycle that is devised to repurpose used markers rather than sending them to landfills. 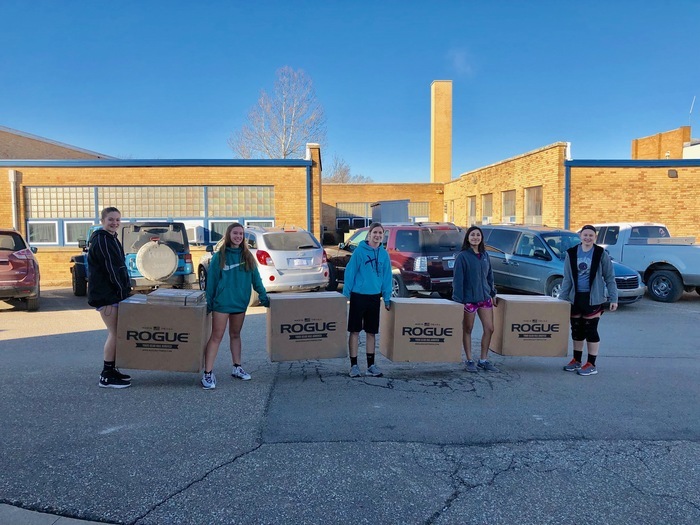 All around Onaga Elementary, students and teachers will be collecting used markers that are ready to be discarded. The 7th habit, Sharpen the Saw, highlights the importance of regular personal renewal. Take a little time out of each day to renew your heart, mind, body and soul by seeking out the things that inspire you. Photo and post by Ian Heit. 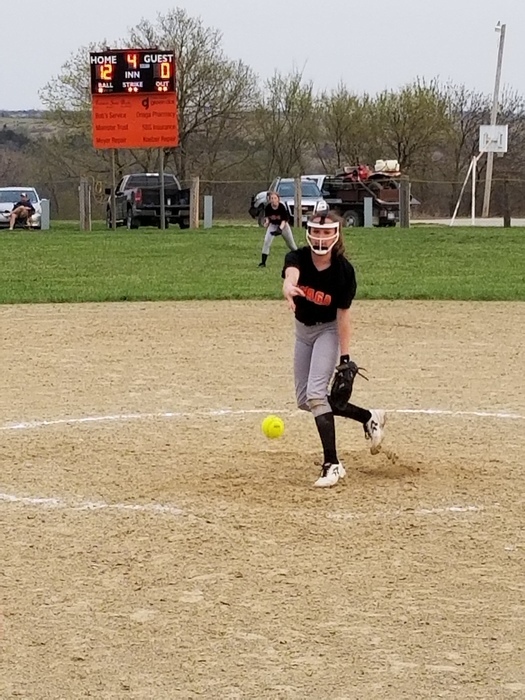 The Onaga High Softball game scheduled for today @ Silver Lake has been cancelled and re-scheduled for Tuesday, May 7 @ Silver Lake. Start time remains the same 4:00 p.m. 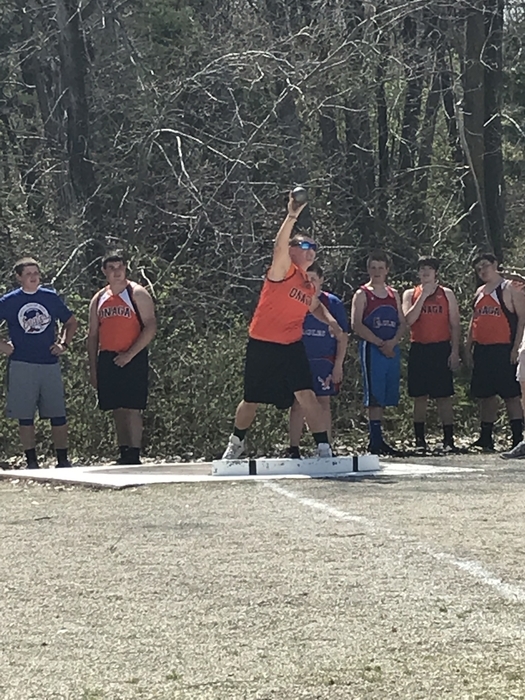 The OHS track meet for today, Thursday, March 28 at Frankfort has been cancelled. A make-up date has not been set. 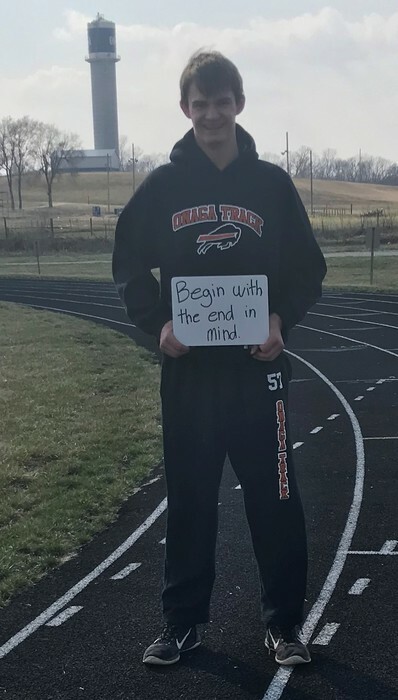 OHS Track Leader of the Week (3/18-3/22) Aaron Schwartz (Habit #2) "I use this habit in life when I start new things by giving it my all and ending the season the best way possible. Having the end in mind is a way to set a goal for yourself to be successful in what you do." 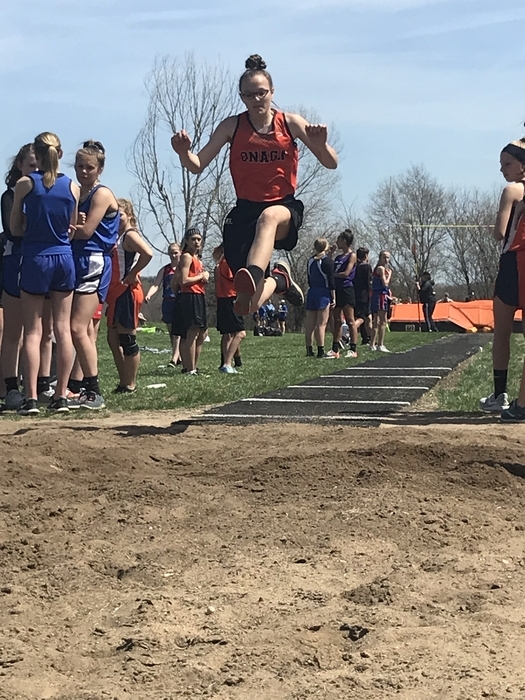 OHS Track Leader of the Week (3/18-3/22) Tess Fairbanks (Habit #2 - Begin with the end in mind) "I apply this to my life by setting my goals high and working hard to achieve them. Sometimes it is a struggle, but I always end up learning something from the challenge." 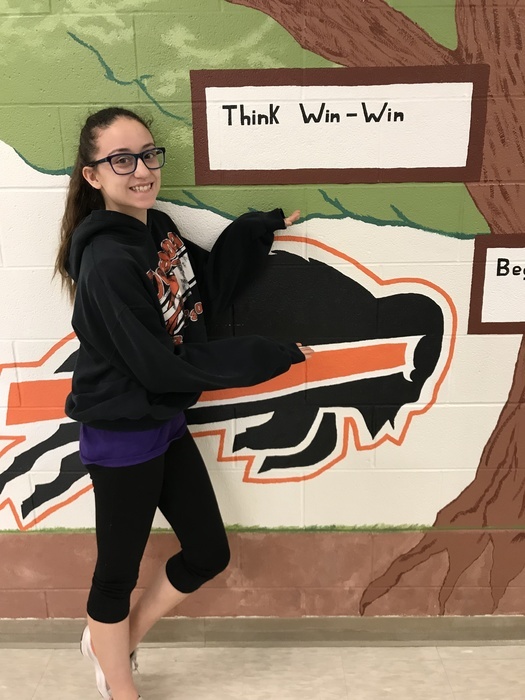 6th Grade Leader of the Week (3/18-3/22) Elocin Moran "My favorite habit is habit one, Be Proactive. I'm proactive by being a leader, listening to the teacher, and finding time to do work that I didn't finish in other subjects." 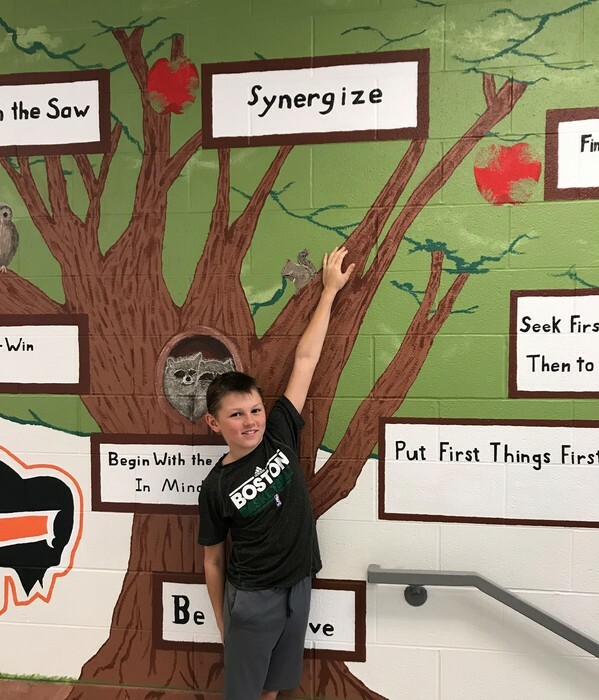 6th Grade Leader of the Week (3/18-3/22) Jackson Kolterman "The habit I use is Synergize. This means that if you work together you can achieve anything. For instance if you have a group of 3 you will get more ideas than you would working by yourself." 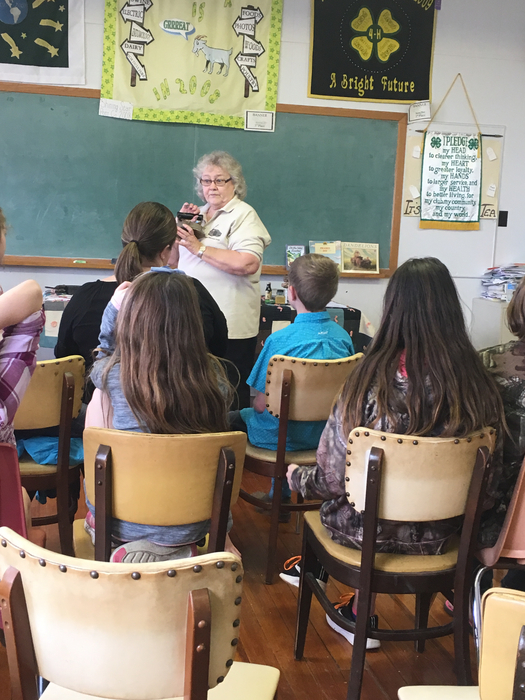 Author Rosie Bosse visited the Onaga School District last Thursday. Mrs. Bosse shared her experiences in writing and encouraged students to try to write books themselves. 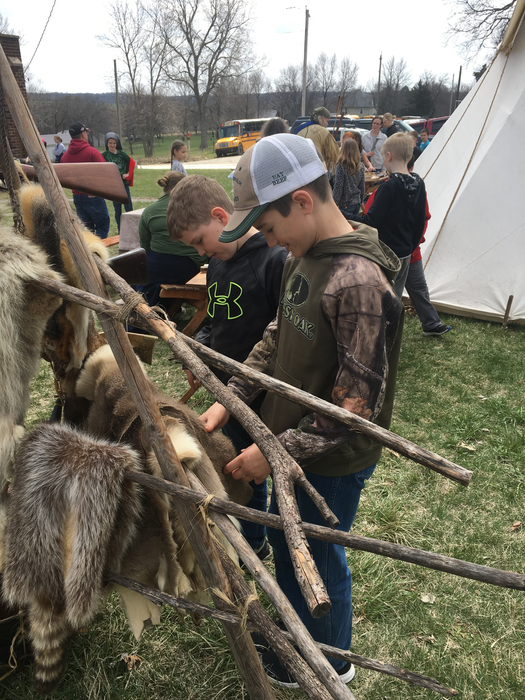 The 6th, 7th, and 8th graders enjoyed the experience. Posted by Ian Morris. This is a reminder that there will be no school on Thursday, March 28th due to the full scale crisis event training. 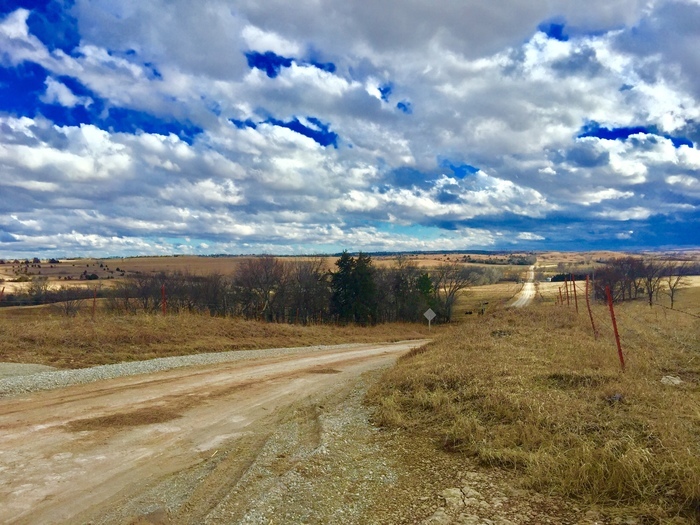 A training exercise will be held March 27-28, at Onaga High School, according to Pottawatomie County Emergency Management. This will help prepare first responders for school emergencies. If you see first responders and emergency vehicles in Onaga on these days, do not be alarmed. 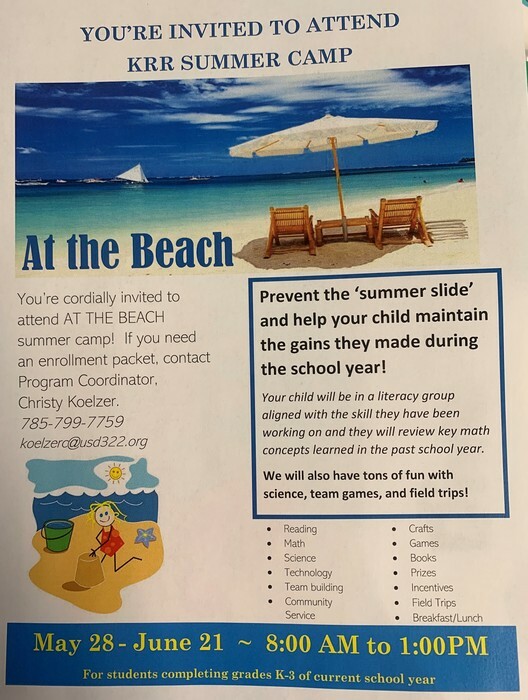 We want to see your child AT THE BEACH! Enrollment for KRR Summer Camp is still open with a few spots remaining. Packets were sent home last week. Please return ASAP. If you have questions or need another packet, contact Christy Koelzer. UPCOMING TRAINING EXERCISE IN ONAGA - A joint training exercise will be held March 27th and March 28th, 2018, at the Onaga High School. This exercise will help prepare emergency personnel to respond to acts of violence. Personnel representing local agencies including law enforcement, fire, emergency medical services, emergency management, and hospitals will be participating in this exercise. 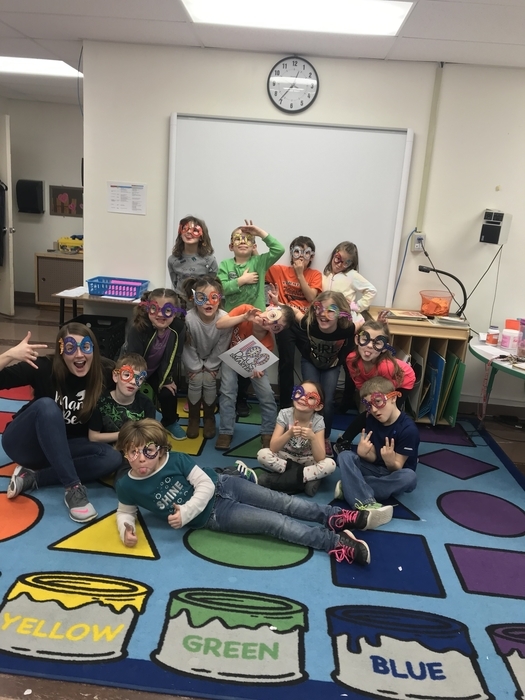 Additionally, citizens may see actors in moulage (makeup to simulate injuries) in the area of the schools and the Onaga Community HealthCare Center on these dates. Citizens who see a large compliment of first responders and emergency vehicles in Onaga on these dates should not be alarmed. Buffalo baseball falls to Nemaha Central 0-9 in 6 innings and 0-12 in 5. We made many improvements from our first night out, and look forward to hosting our first ever home game on April 1st. 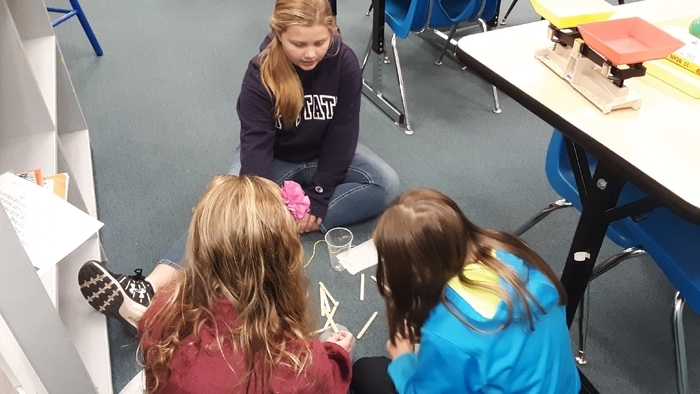 The 8th Grade Science class organized Seuss & Science activities for the elementary students. 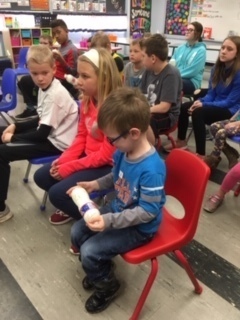 The students made butter and Oobleck, worked with electronic boards and cup stacking, and observed a can crushing experiment. The event was held last Thursday. 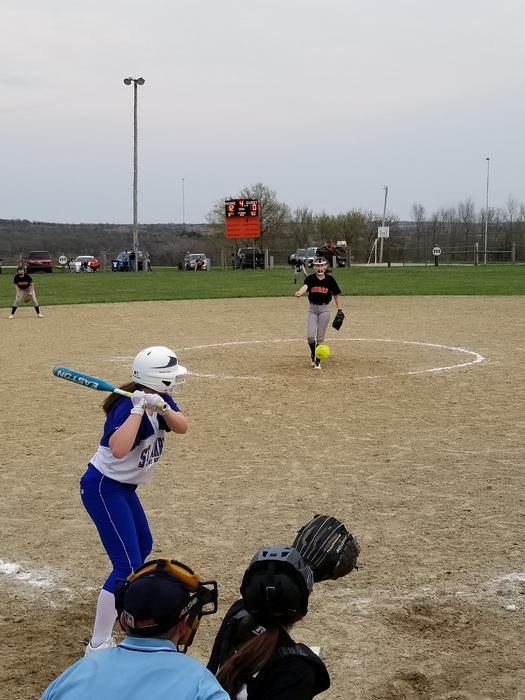 OHS softball traveled to Rock Creek tonight for a double header. Despite their effort, the team lost the first game 3-2 and the second 8-6. 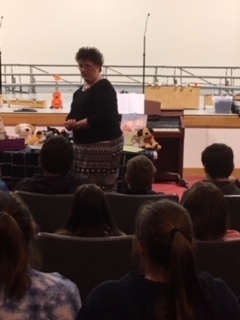 Rosie Bosse, a local author, visited with elementary and Junior High students last week. 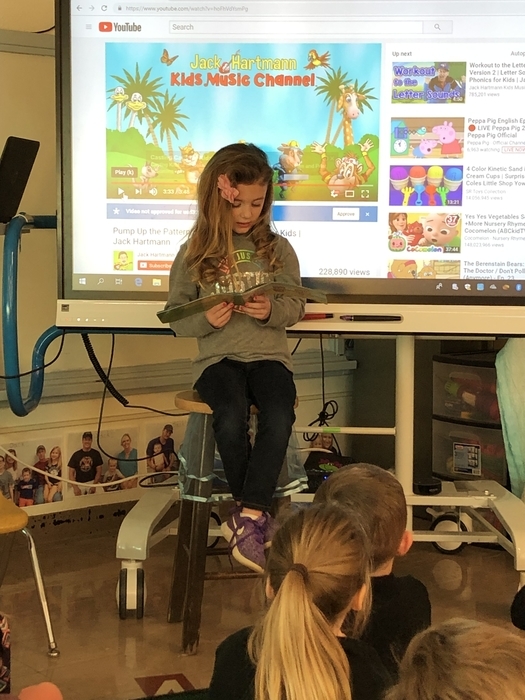 She talked to them about how to write and publish a book and read one of her books she wrote about Curly, the Orphan Calf. Onaga Middle School sixth grade student Zachary Peters looks through the books available at the book fair in the library. Reading is a good example of Habit #7 "Sharpening the Saw" and improving your mind. Posted by Lilly Carl. 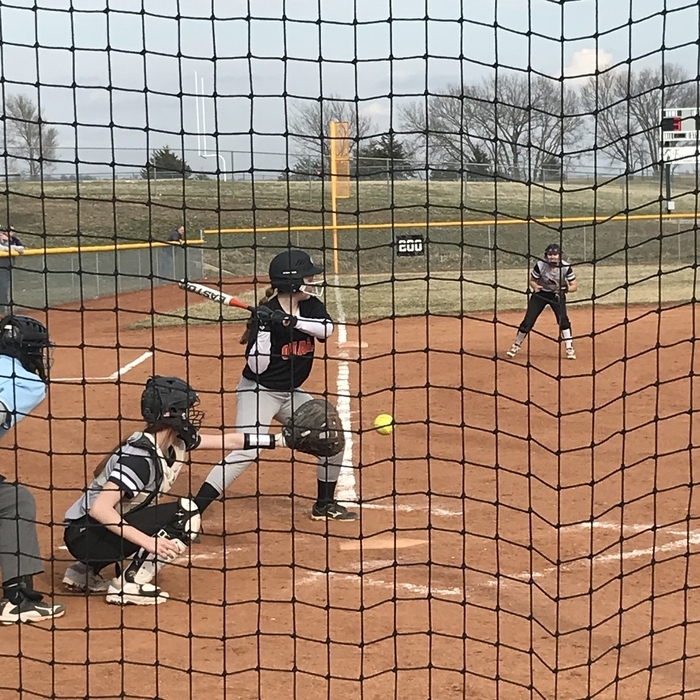 The softball team will be playing Rock Creek at 4pm on Monday, March 25, at the field in Flush. 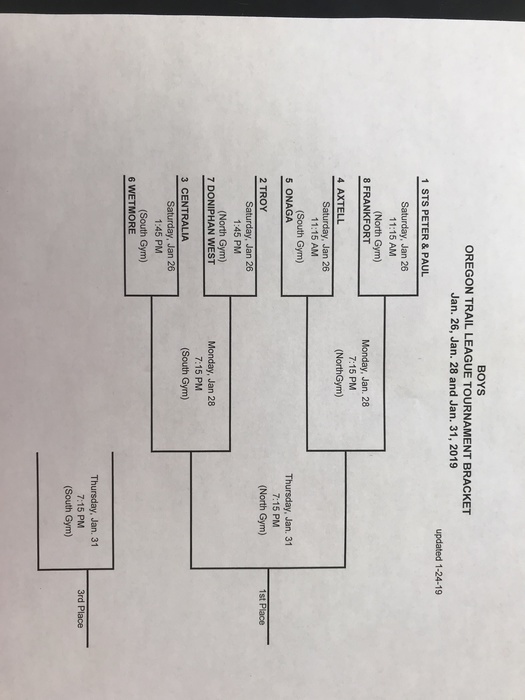 The baseball games on Monday begin at 430 will be played in Seneca. The field in Seneca is located at 1600 Community. It is located across the street from the hospital. Good luck! 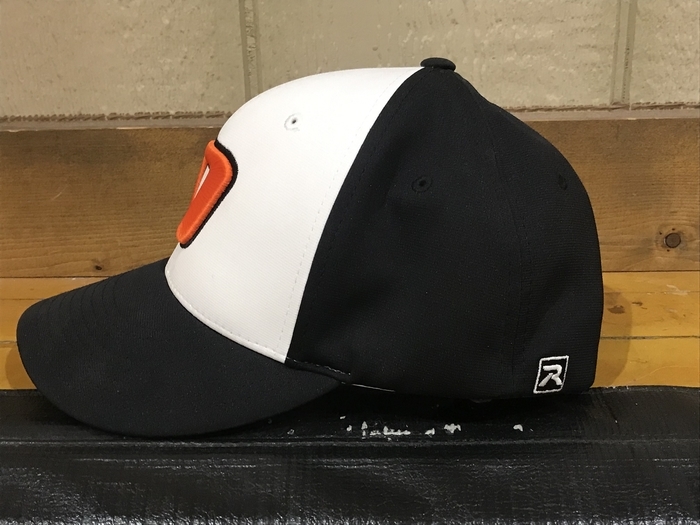 Onaga Baseball JV debuts at Rock Creek, falling 15-0 in 3 innings and 15-0 in 4 innings. Colby Henneberg is the first base runner in program history drawing a lead-off walk. Josh Marten records the first base hit. This group is really going to be fun to watch! 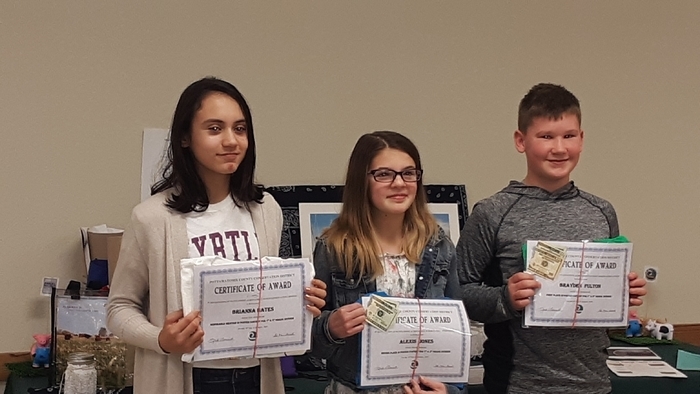 This morning, Onaga K-12 students had an assembly for the Leader In Me to discuss the private victory habits: Be Proactive (#1), Begin With the End in Mind (#2), & Put First Things First (#3). We also recognized students who have shown these habits in the past month. 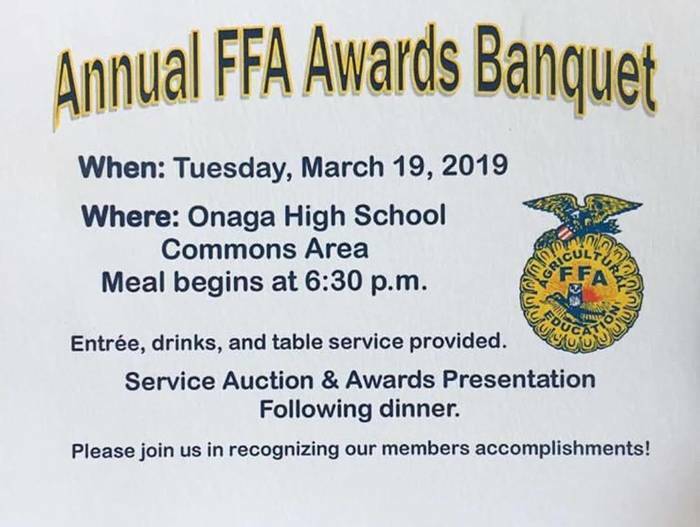 Everyone is invited to attend the Annual FFA Awards Banquet tonight (3/19/19)! 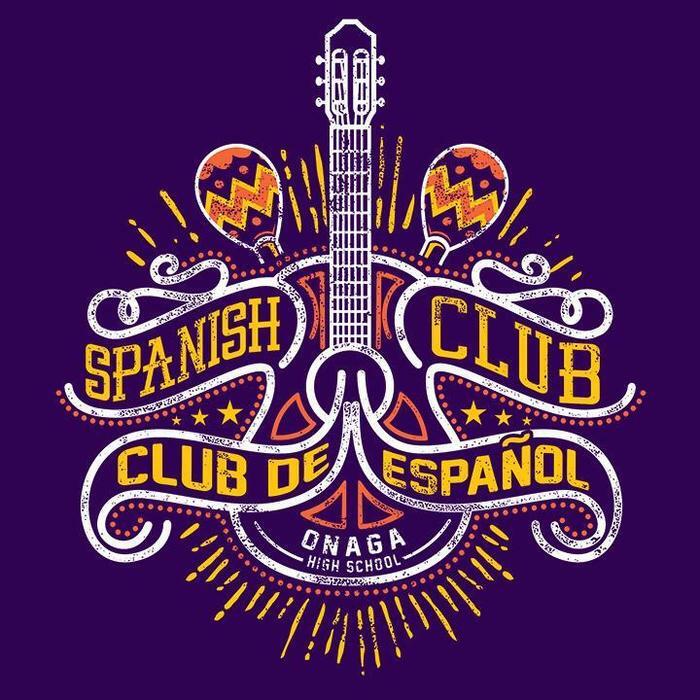 Meal starts at 6:30 in the OHS Commons Area with the awards and service auction to follow. The new officer team will also be installed tonight! Please join us in recognizing our FFA's accomplishments. Bsb will be AT ROCK CREEK on Thursday, starting at 4:30. 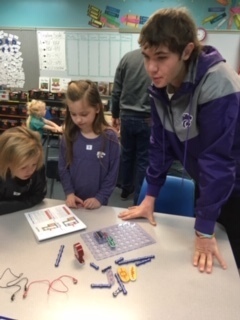 OHS Students enjoy an afternoon of fun together before the week long spring break they've been looking forward to. 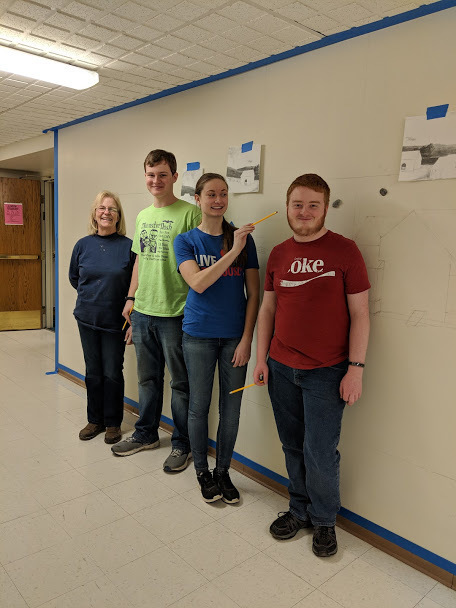 Special thanks to Mrs.Labbe and the KAYS association for putting on this event and hyping students up for spring break. 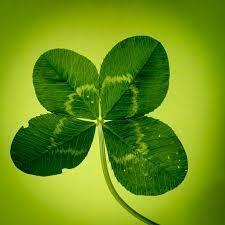 Did you know the odds of you finding a four leaf clover are 1 in 10,000?! Legend says that each leaf of has a different meaning! They are hope, faith, love, and luck! Have a fantastic Saint Patrick's Day! 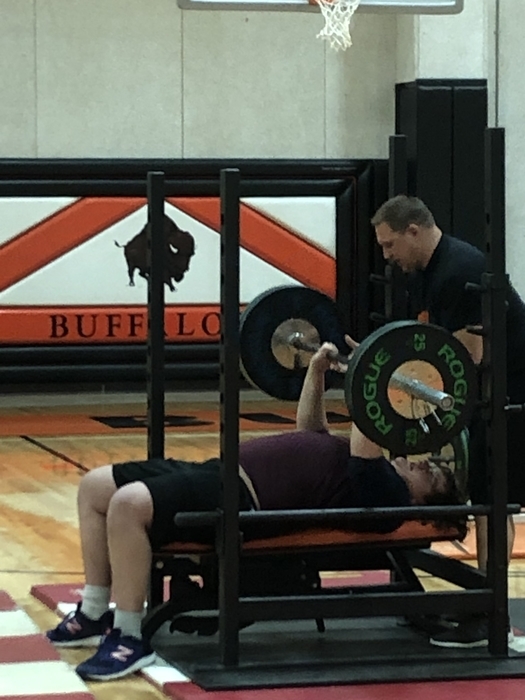 Donnie Wright showcasing tremendous strength for a freshman. 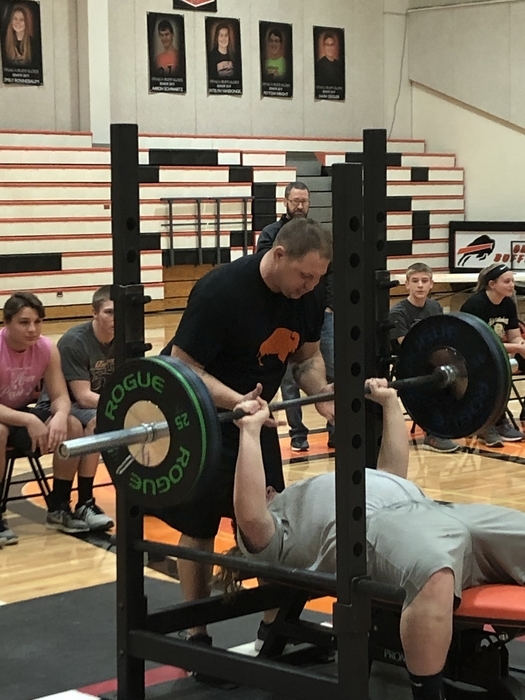 Enjoyed watching our junior and senior high athletes showcase their strength gains during the Onaga Lift a Thon. Had a large crowd present to cheer on our kids. Well done everyone. 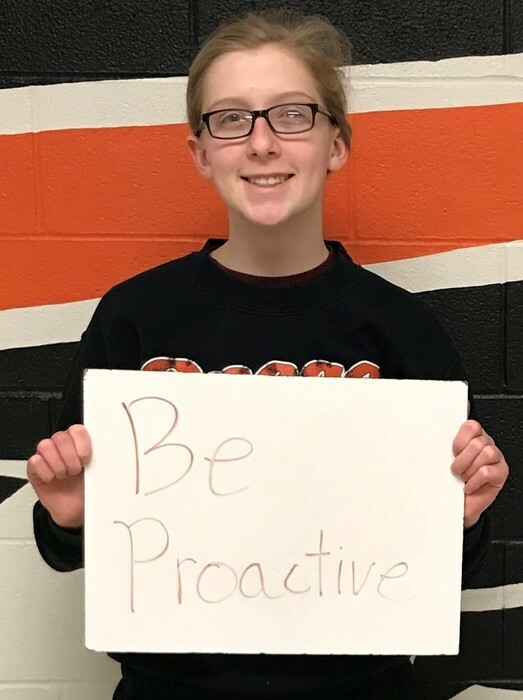 OHS Track Leader of the Week: Tess Fairbanks (Habit #1 Be Proactive) "I think it's important to remember that life doesn't just happen to you, and ultimately you have control. Even when things are hard and nothing seems to be going right, I have control over how I act." 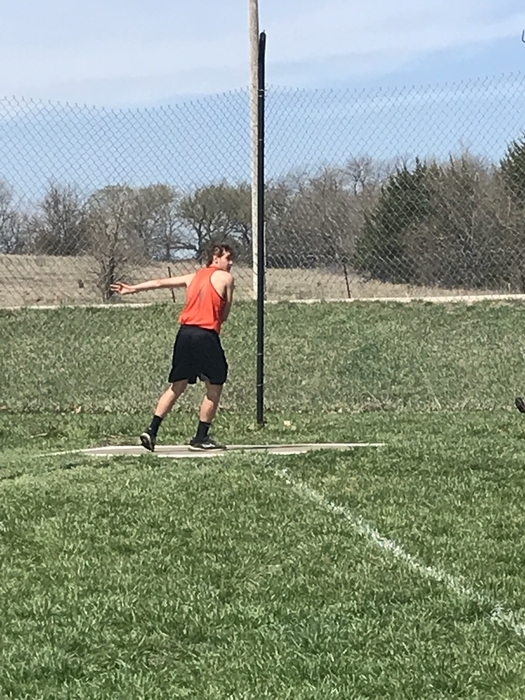 OHS Track Leader of the Week: Aaron Schwartz (Habit #5 Seek first to understand and then to be understood) "I apply it to my life by using it as a way to learn from my mistakes to make me a better person and teammate." I can't possibly be the only person dreading the continuity of this long, bitter cold winter. 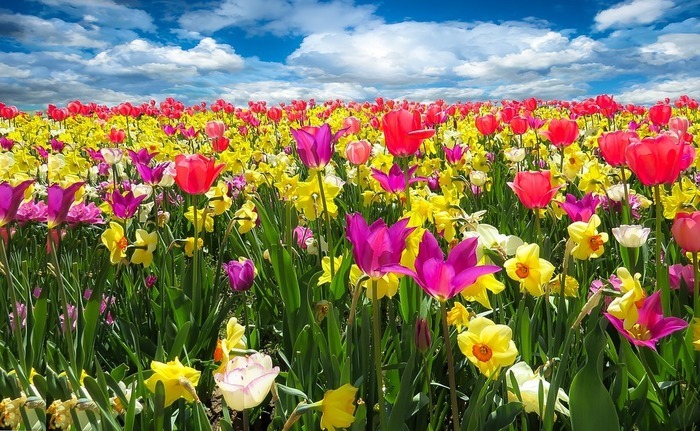 Instead of continuing to dread these bitter cold winds and knee deep snow drifts, take a look at this beautiful spring picture as you prepare for a hopefully warm spring break next week. We have re-scheduled the author visit with Rosie Bosse for March 21, 2019. 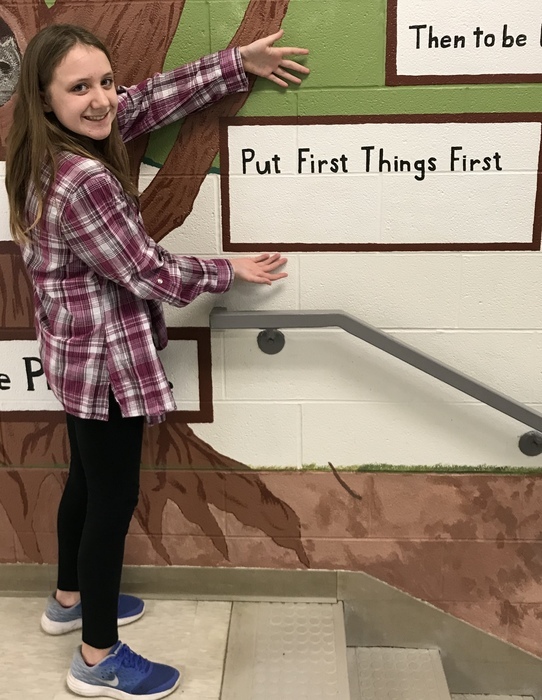 6th Grade Leader of the Week LJ Koelzer (2/25-3/1/19) "I like Habit #3 Put First Things First. I do it by working with my dad before I play games. I like it because it keeps me organized." 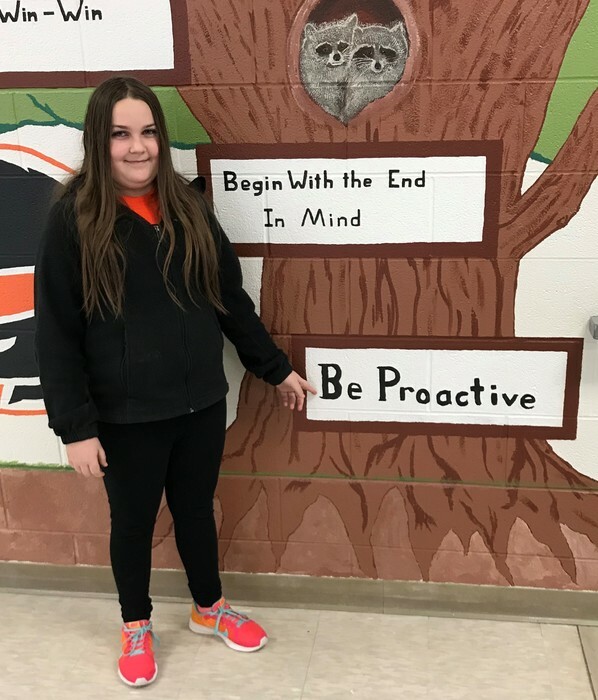 6th Grade Leader of the Week (2/25-3/1/19) Delaney Figge " I picked Habit #1 Be Proactive because it really helps me in life. When I'm at home doing nothing I will be proactive and read my AR book." 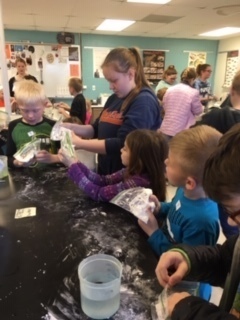 KRR After School Program Parents: please note that we WILL have After School on March 19 and 21 (parent-teacher conference dates). We WILL NOT have it on March 27 and 28. Due to the winter weather and windchill, Onaga Schools will be starting 2 hours late tomorrow morning, March 4th. No breakfast will be served. 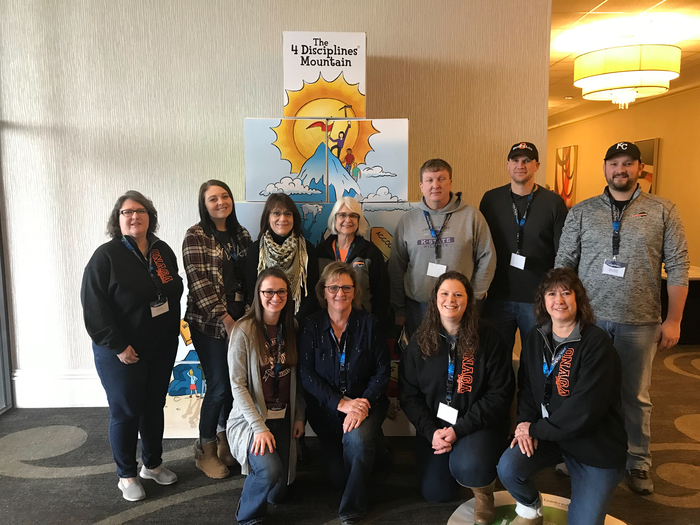 A group of staff members attended a Leader In Me Symposium this week and engaged in a number of activities. 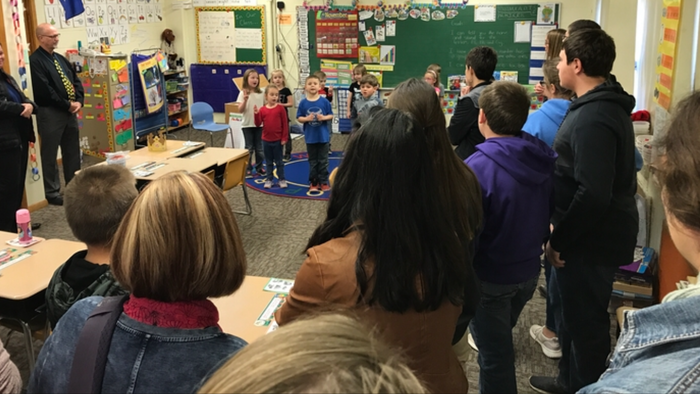 They had a great time learning about ways to implement and practice TLIM skills on a daily basis. The Leader in Me is not something we do....It’s who we are! March 2nd is the anniversary of the birthday of Dr. Seuss, author of many well-loved childrens’ books. 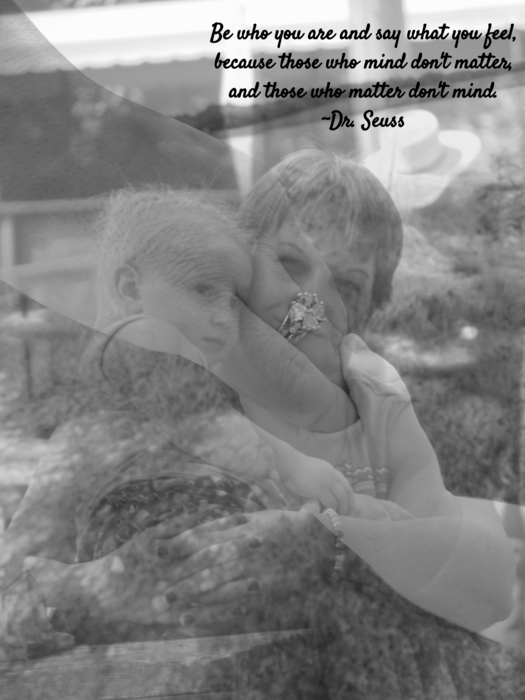 This is my quote I chose from him on photos I have taken and edited. My mother, Crystal, and my baby sister, Juliette, are the great posers in my photo. March 2nd is the anniversary of the birthday of Dr. Suess, author of many well-loved children's books. 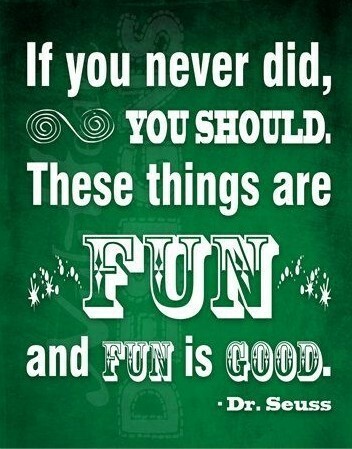 This is my favorite Dr. Suess quote. 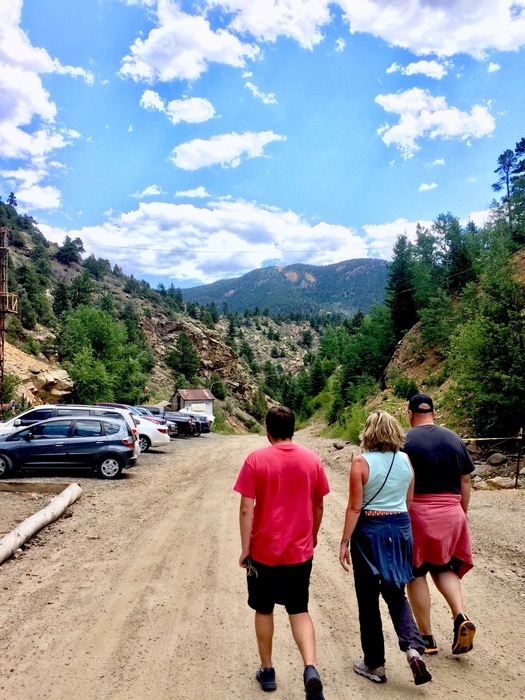 “Oh the places you'll go! There is fun to be done! There are points to be scored. There are games to be won. And the magical things you can do with that ball will make you the winning-est winner of all.” ― Dr. Seuss, Oh, The Places You’ll Go! Due to some slick areas, Onaga Schools will be starting 2 hours late this morning, Wednesday, February 27th. No breakfast will be served. 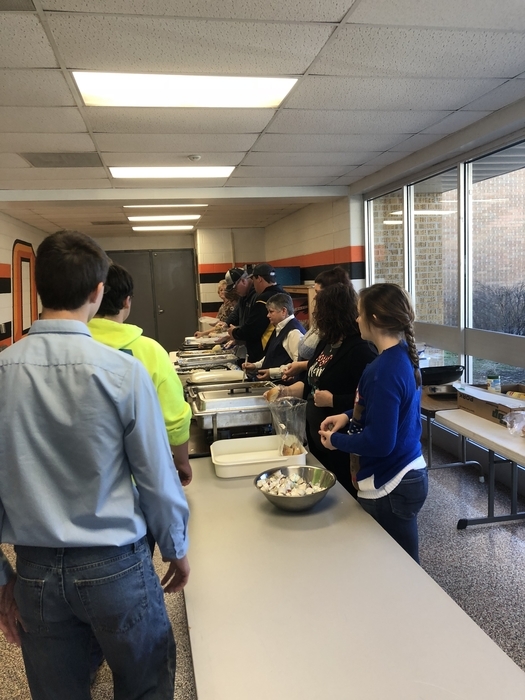 The FFA Banquet and Service Auction has been rescheduled for Tuesday, March 19 from 630-930 pm in the Commons. Thank you. 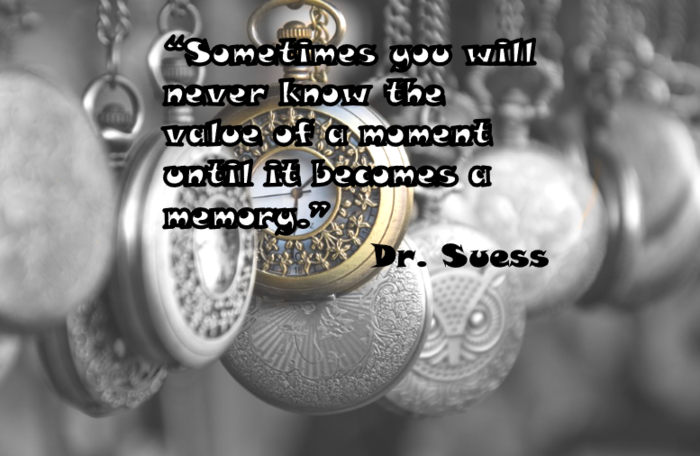 March 2nd is the anniversary of the birthday of Dr. Suess, author of many well-loved childrens’ books. This is my quote I chose from him. 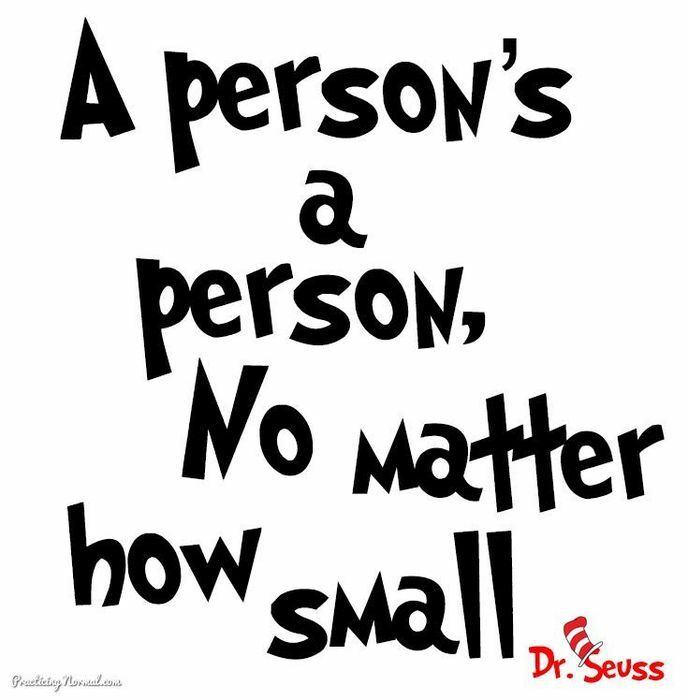 March 2nd is the anniversary of the birthday of Dr.Suess, author of many well-loved children's books. This quote is my favorite. 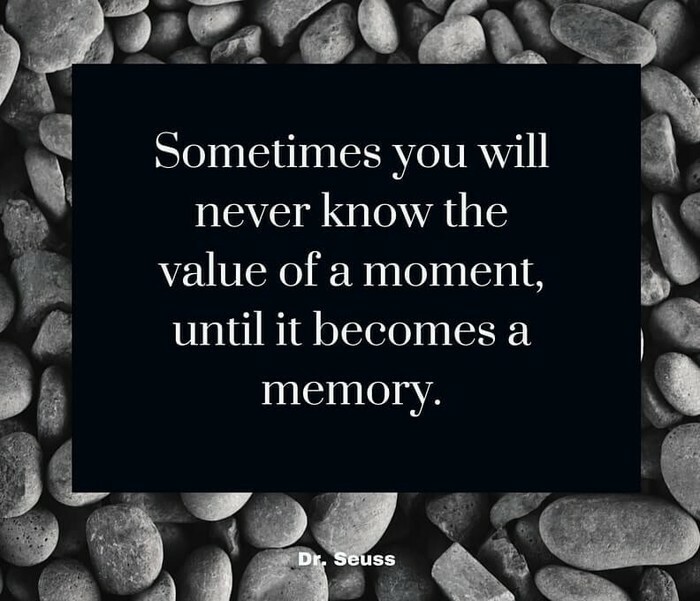 As you may know March 2nd is the anniversary of the birthday of Dr. Suess, I have selected just one of my favorite quotes from this well beloved childrens author. 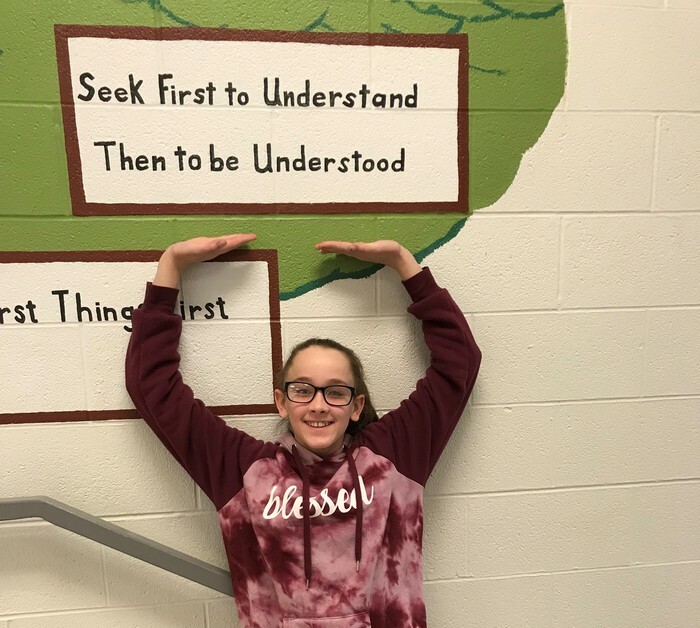 6th Grade Leader of the Week (2/18-2/22) Phoenix Weixelman "I like Habit #5 Seek First to Understand, Then to be Understood. The reason is that I get self-conscience about what I say pretty easy and because I listen to people first before I talk." 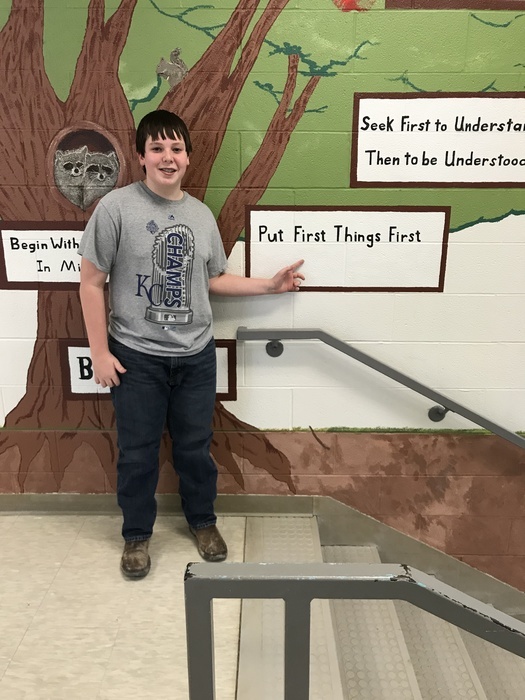 Sixth Grade Leader of the Week (2/18-2/22) Jacob Ronnebaum "I like Habit #1 Be Proactive. I do my homework when I have time and before I play games." 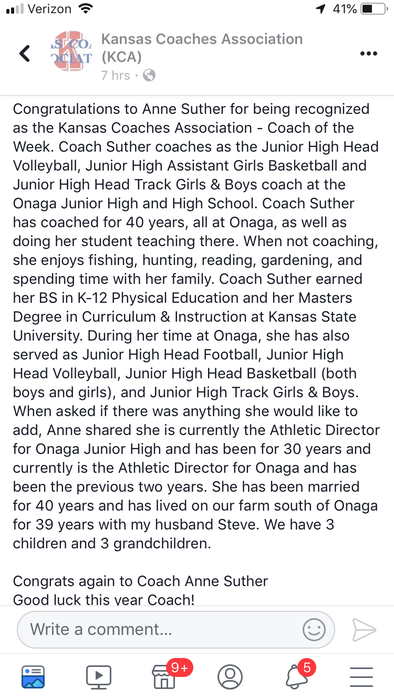 Two NEW people were added to the "Onaga High School Athletics Hall of Fame" a few weeks ago. The new people added were Dana Pollock & Ron Lee. Both made big achievements and outstanding contributions to our athletics program. 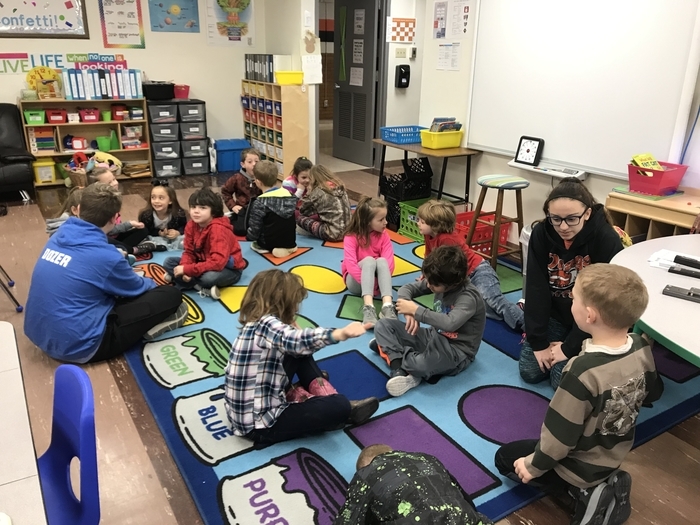 Mrs. Uhl and Mrs. Huerter’s class discuss how they sharpened their saw for Leader in Me time every Monday morning. 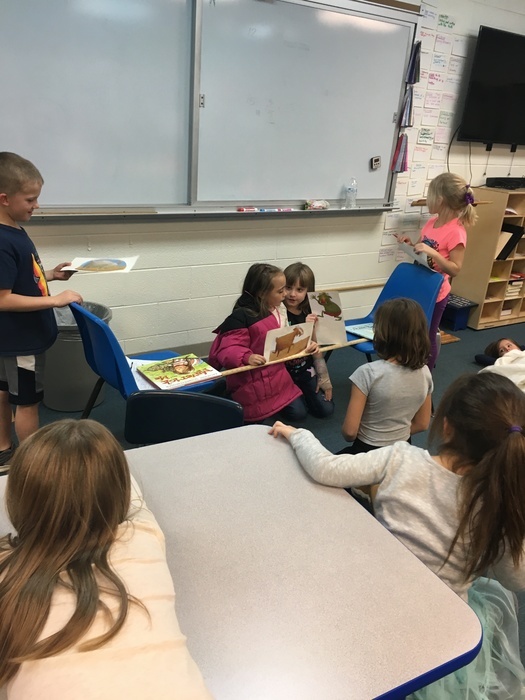 The kids enjoy hearing what their friends did over the weekend. Friday fun days are the best because we get to synergize with our preschool buddies!! Sixth Grader Leader of the Week (2/11-2/15) Heath Cress "My favorite habit is #3 Put First Things First and I use it every day by doing my homework before I play games." Sixth Grade Leader of the Week (2/11-2/15) Elocin Moran "My favorite habit is #3 Put First Things First. I acquire this by putting more important things first and work my way down to the less important things." 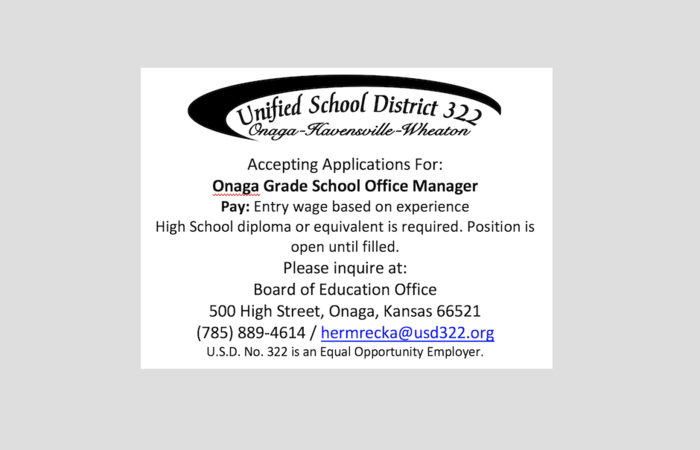 DID YOU KNOW…We have our USD 322 Onaga Twitter account up and running again? 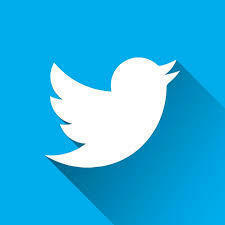 Download the Twitter app and follow us @Buff322. 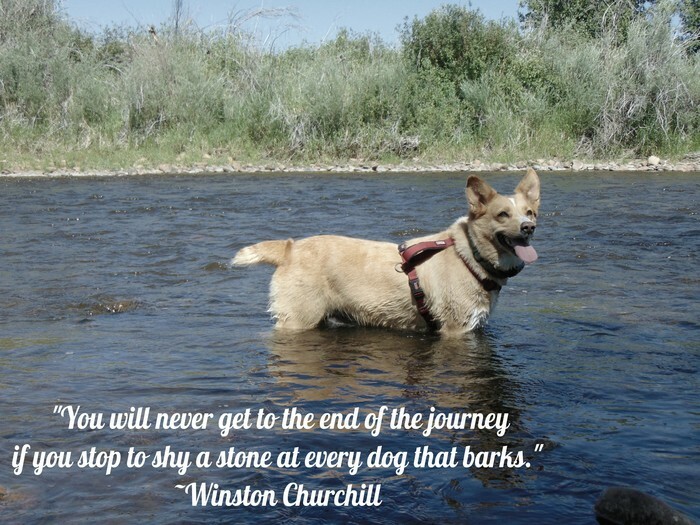 Yesterday was “love your pet day”! At Onaga Schools everyone expresses their love for Pepper our friendly furry therapy dog! Boys season ends in Centralia tonight, falling 43-30, after trailing 32-9 at half. We are very proud of how they battled throughout the 2nd half. Due to the winter weather, Onaga Schools will be closed tomorrow, Wednesday, February 20th. 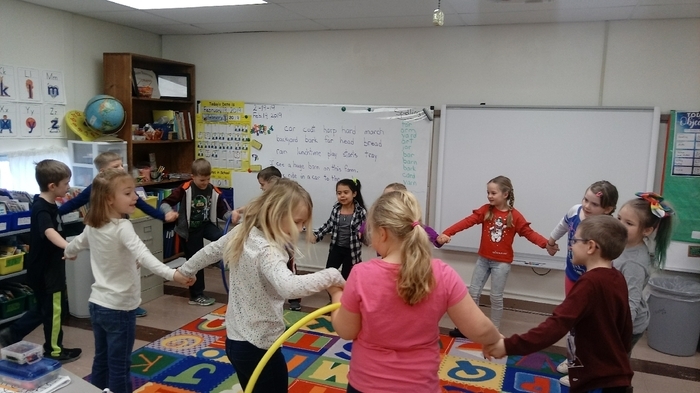 Mrs. Uhl's and Mrs.Huerter's first graders practiced synergizing with hula hoops! Due to the incoming weather, KRR After School Program Is canceled today, Tuesday, February 19th. DID YOU KNOW.. our District Office was a 1940 WPA project? The WPA was an American New Deal agency, employing millions of people to carry out public works projects, including the construction of public buildings and roads. See the plaque by the front door of the District Office. Halftime at D West Lady Buffaloes are battling, down 24-29. 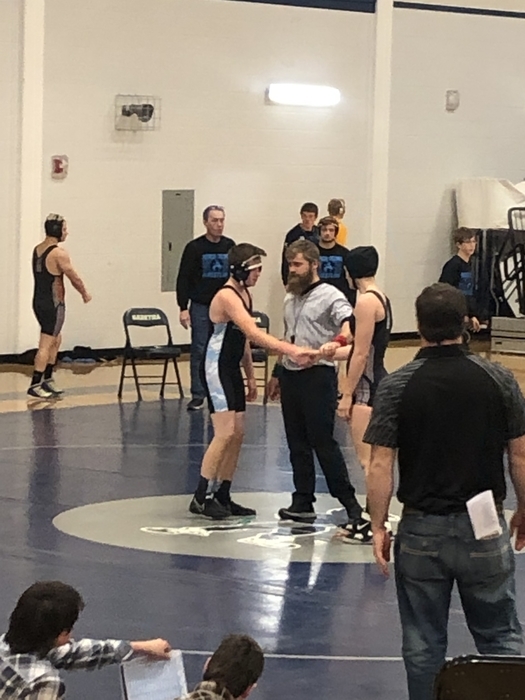 Good luck to Morgan Mayginness, Vincent Lara and Kameron Henneberg as they seek to earn state wrestling berths today at regionals. Good luck to our Buffaloes!!! The junior high dance has been postponed to a later date. Due to the incoming weather, Onaga Schools will be canceled today, February 15th. 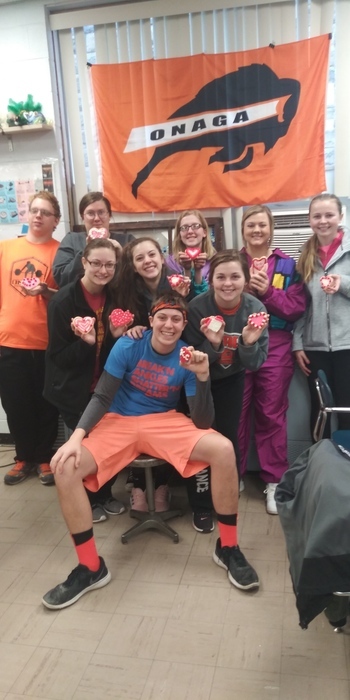 On February 8th, Onaga High School had its annual Winter Royalty pep rally. 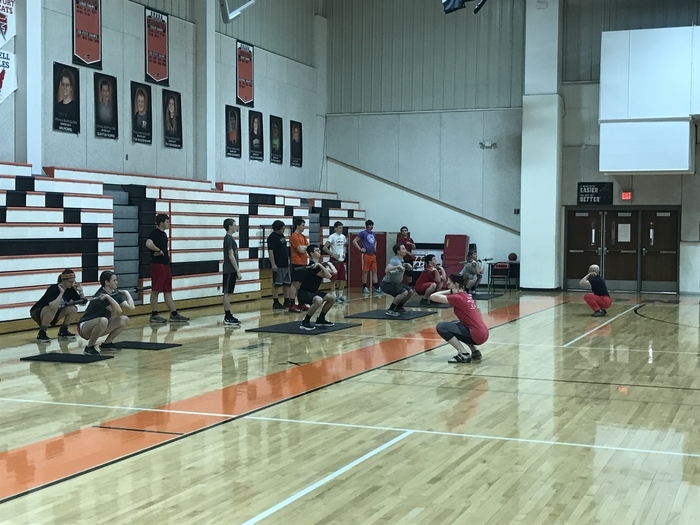 Keith Figge, coach for the girls basketball team and Ryan Noel, coach for the boys basketball team, spoke words of encouragement to their players and hyped up the community for the games to follow. 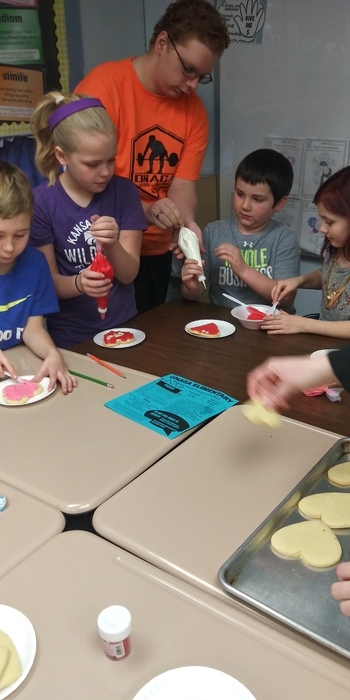 The senior Chemistry 2 class, for their “Leader in Me” time on the morning of February 6th, went to Mrs. McNally’s third grade class to decorate heart cookies and to teach the students how to use different frosting bags. 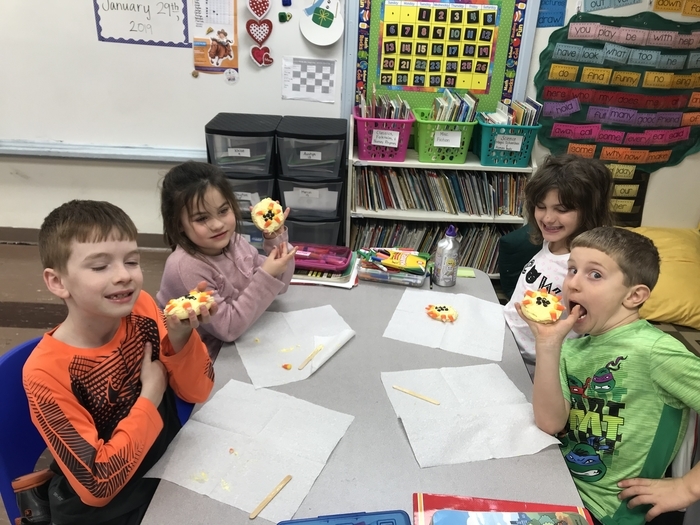 The third graders really enjoyed decorating their cookies. Onaga Schools will be starting 2 hours late tomorrow morning, February 12th. School will begin at 10:00am. No breakfast will be served. Our USD 322 Board Meeting originally scheduled for this evening has been rescheduled for Monday, February 18th at 6:00pm. 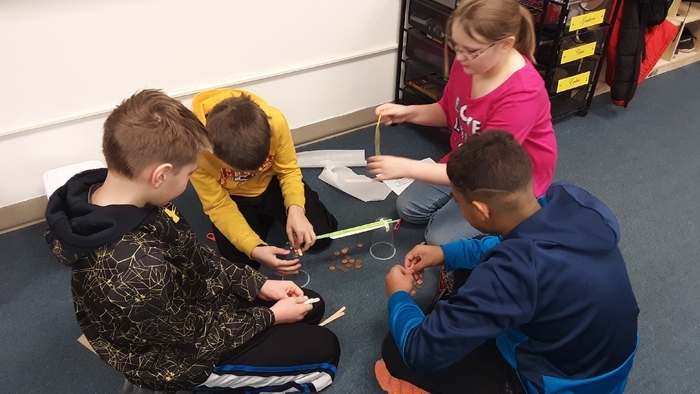 Due to the winter weather, Onaga Schools will be releasing students TODAY, February 11th, at 12:00pm. Students will be fed lunch before they are released. All activities are cancelled. 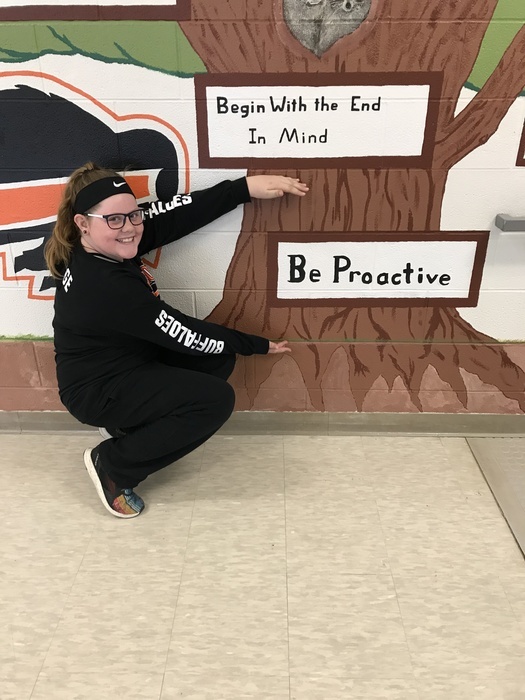 Sixth Grade Leader of the Week (2/4-2/8) Savannah Kolterman "I like being proactive because I like to get what I need done. I am proactive when I do my homework because I do it when I am supposed to." 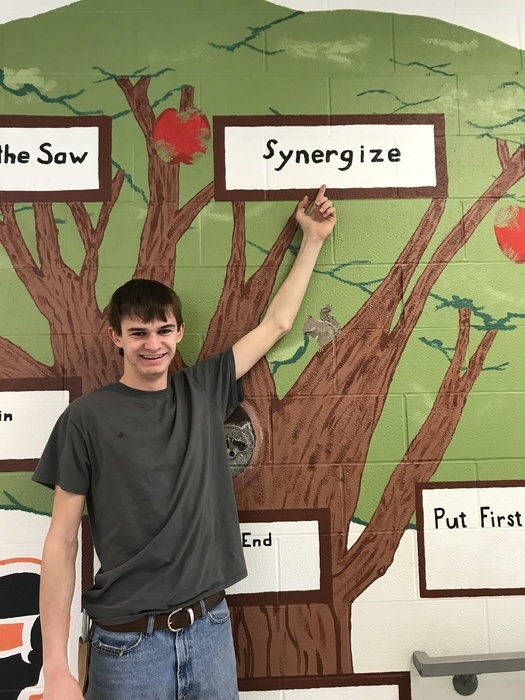 Sixth Grade Leader of the Week (2/4-2/8) Tad Szel "I like Habit 6 Synergize. I am able to work with people even if they disagree. 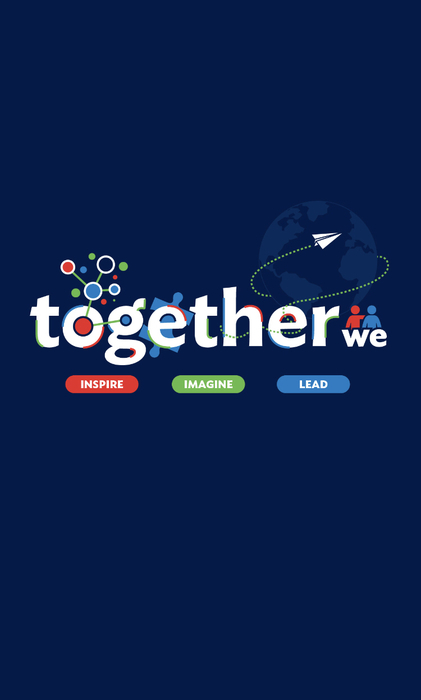 Like when I am working in groups people disagree and I can help them compromise." Here are our teams for Junior High Scholars Bowl, preparing for a meet. This photo was taken on January 29th, 2019. There will be a make-up LIFE session Monday, February 11 at 5:15. We will have our regular scheduled session as well on Thursday, February 14. Due to the winter weather, Onaga Schools will be closed tomorrow, Thursday, February 7th. 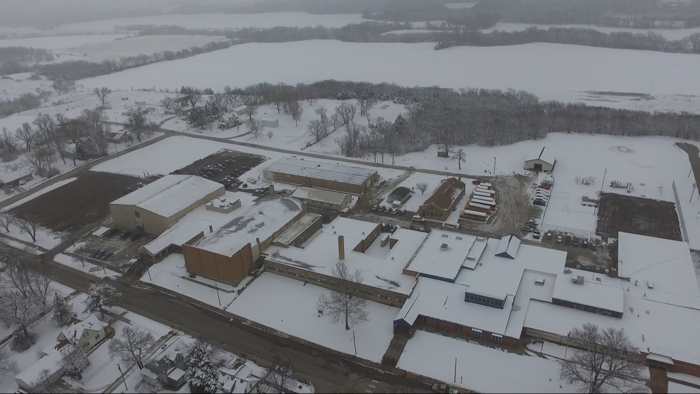 Due to freezing drizzle and slick roads, Onaga Schools will be dismissing at noon today. All students will be fed lunch before dismissal. Preschool playground equipment fundraiser!! 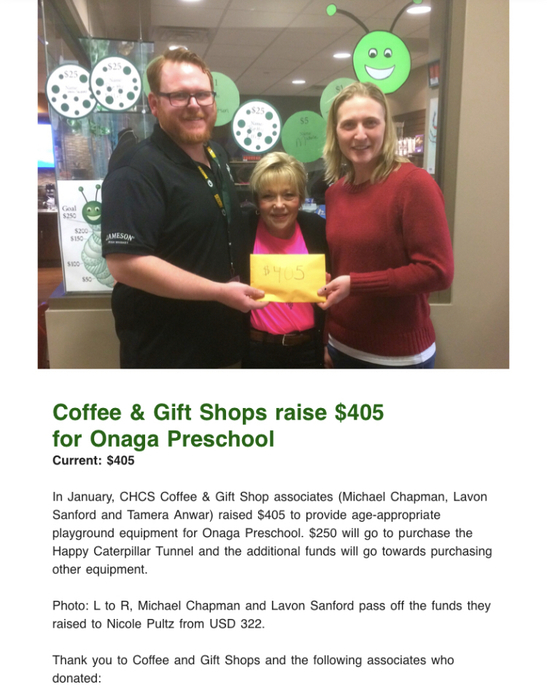 Thanks to Community Hospital of Onaga for supporting our preschool program and fundraising to help buy equipment! 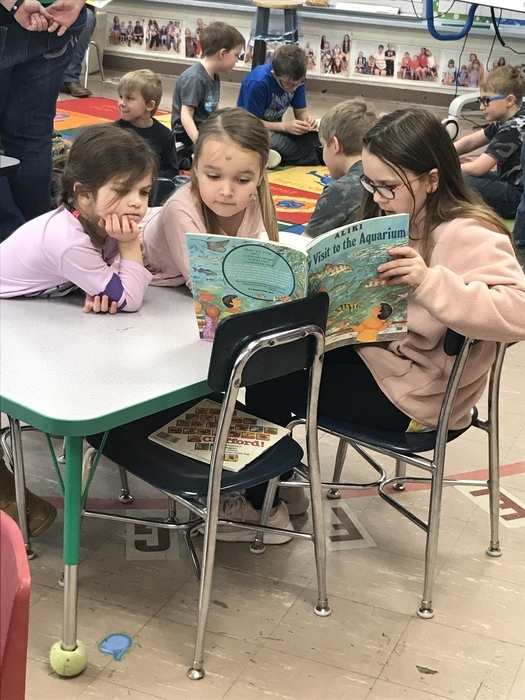 Community Partnerships are so important to our district! 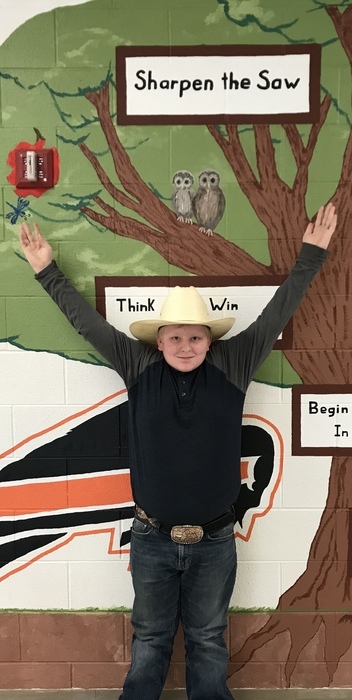 6th Grade Leader of the Week (1/28-2/1) Wyatt Figge " I like Habit #7 Sharpen the Saw because I know I need to take care of myself so I can do my best. I do this when I go to bed on time." 6th Grade Leader of the Week (1/28-2/1) Vanessa Koelling likes Habit #3 Put First Things First. "I like this habit because it helps me understand what I need to do first. If my friend asked me to come over to their house but I had homework to do I would do all my homework first." 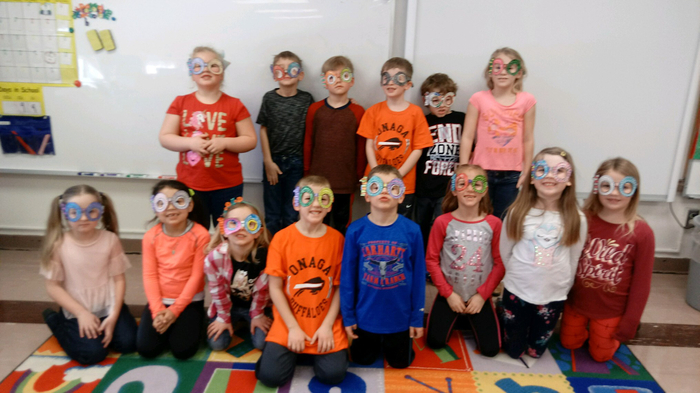 Mrs. Uhl and Mrs. Huerter’s class celebrated the 100th day of school on Friday, Feb. 1st. 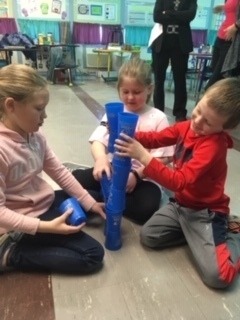 The kids participated in many activities that required them to count to 100. 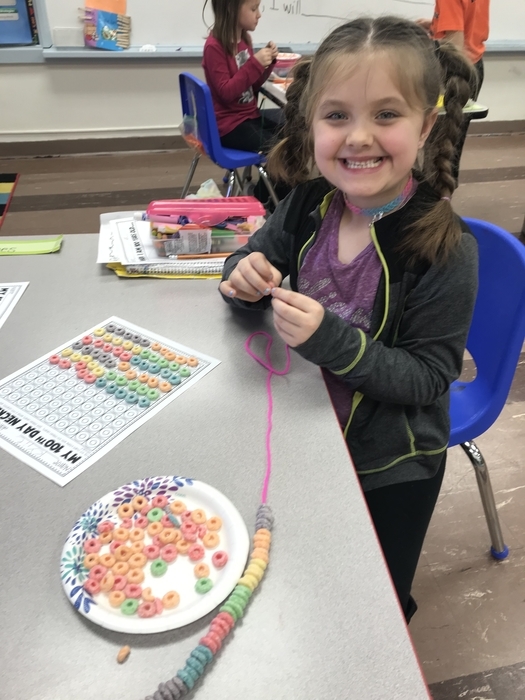 Their favorite activity was putting 100 fruit loops on a necklace and then getting to eat them. 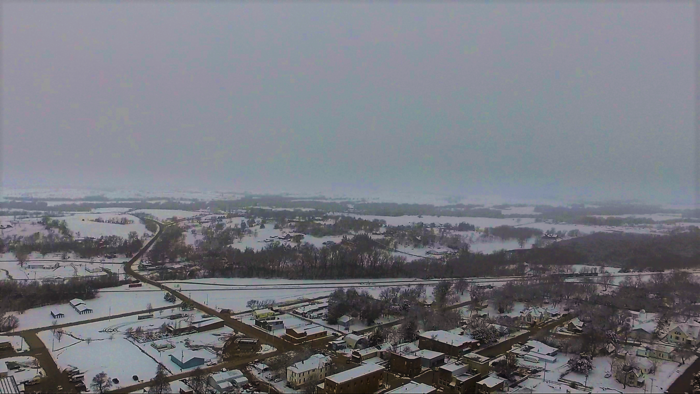 On January 14, 2018, Onaga students Ian Heit and Ian Morris decided to take the School’s photo and video capture drone up to get some interesting pictures of a snow blanketed Kansas landscape. The pictures were taken at an altitude of 432 Feet, and at a temperature of 27°F. 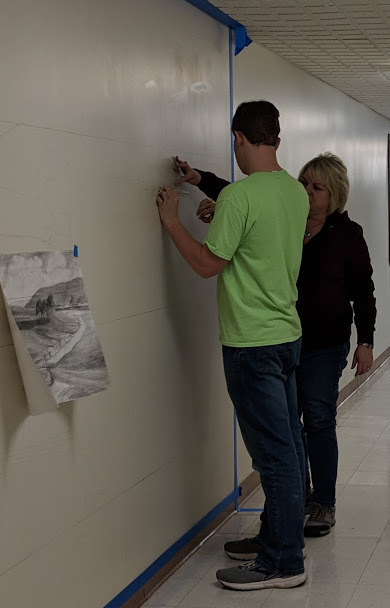 On January 16, 2019 three seniors from Onaga High School paid a visit to Community HeathCare Systems in Onaga Kansas, to help prepare a mural depicting the Kansas landscape. Ian Heit, Tyler Roggenkamp, and Kinzi McLaughlin spent two hours creating a scene the public could enjoy. 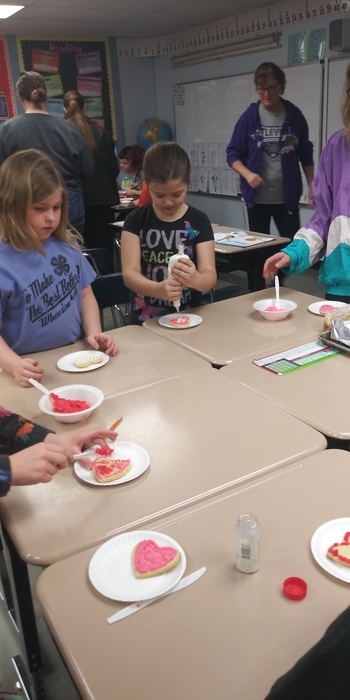 Mrs. Uhl and Mrs. Huerter’s first graders celebrated Kansas’s Birthday on Tuesday, January 29th. 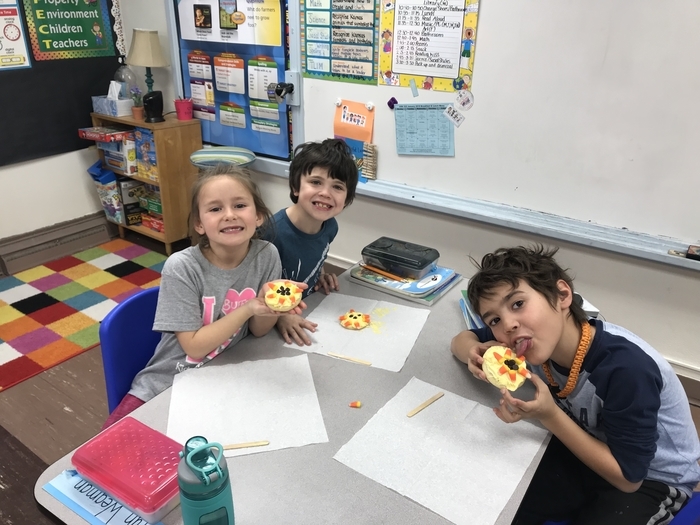 The kids frosted cookies and put chocolate chips and candy corn on them to make sunflowers. 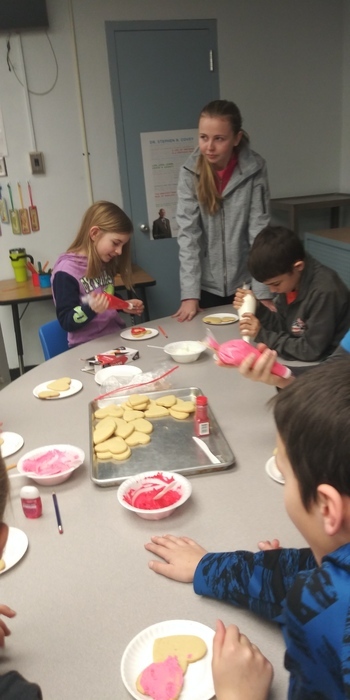 The kids liked eating the cookies the best! Trenton Cott grappling a difficult opponent who Cott would end up pinning. Vincent Lara walking off the mat after pinning his opponent to close out the night. 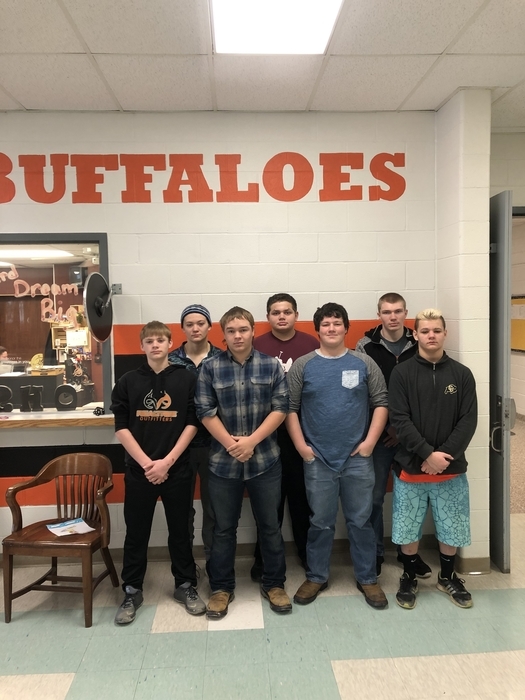 Onaga Buffaloes Wrestling team put on a solid performance tonight at Sabetha. 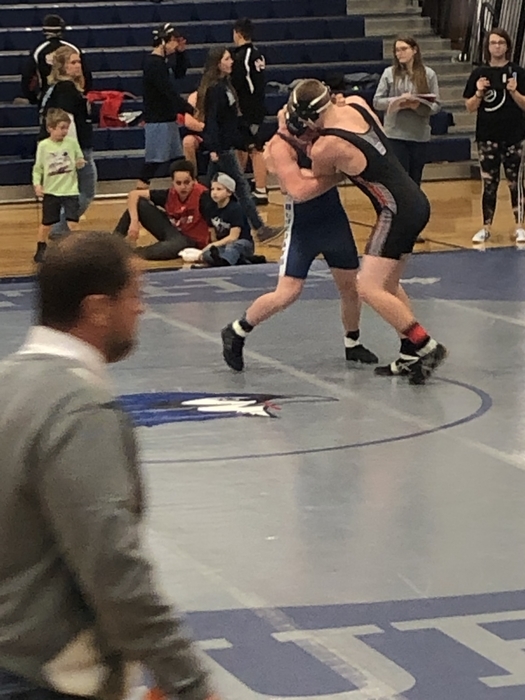 Kameron Henneberg and Trenton Cott both went 3-0 tonight and Vincent Lara went 2-1. Everyone should come out for our Onaga dual tournament this Friday at home to support Kaid, Morgan, Rylin, Trenton, Kameron, Tommy and Vincent. Looking forward to it! Due to the extreme wind chills projected for tonight and throughout tomorrow, Onaga Schools will be canceled tomorrow. 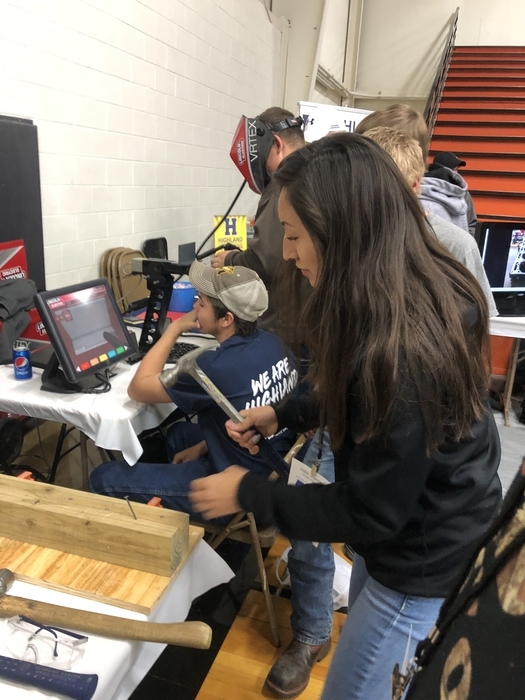 Halie Jeanneret announced the starting lineups at the 1.28.19 OTL Tournament at Onaga. She has been announcing for about 2 years. Halie announces to show her school spirit and to add an extra “pizazz” to the junior high level. Next year, she plans to broadcast the play-by-plays. 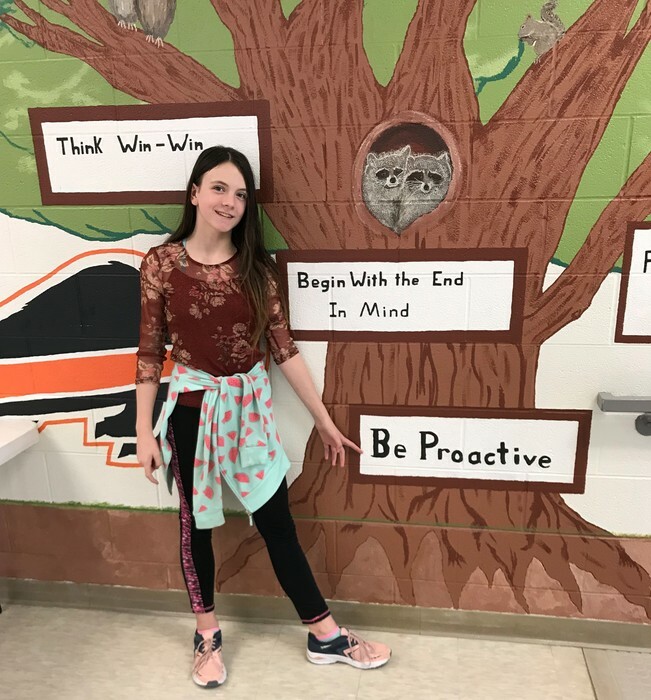 6th Grade Leader of the Week (1/21/91) Jaeden Abitz "I like Habit #5 Seek First to Understand, Then to Be Understood because when you get in arguments most of the time it's just because people didn't understand what was going on." 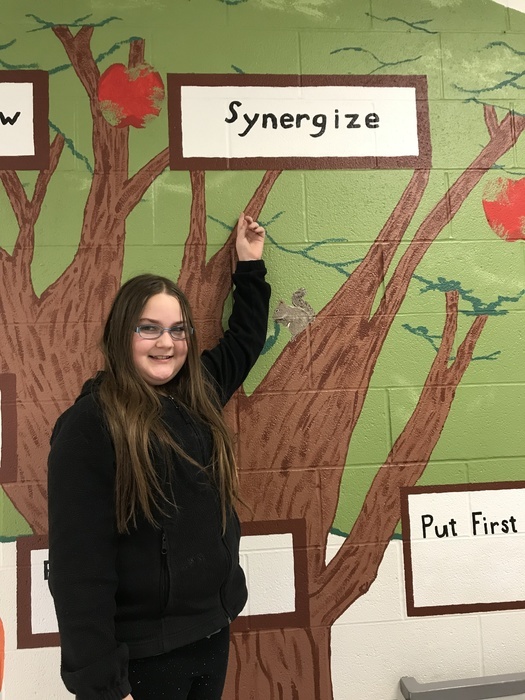 6th Grade Leader of the Week (1/21/19) Savannah Kolterman "Habit #6 synergize because I like to work with other people. I synergize when I work with my table groups at school." 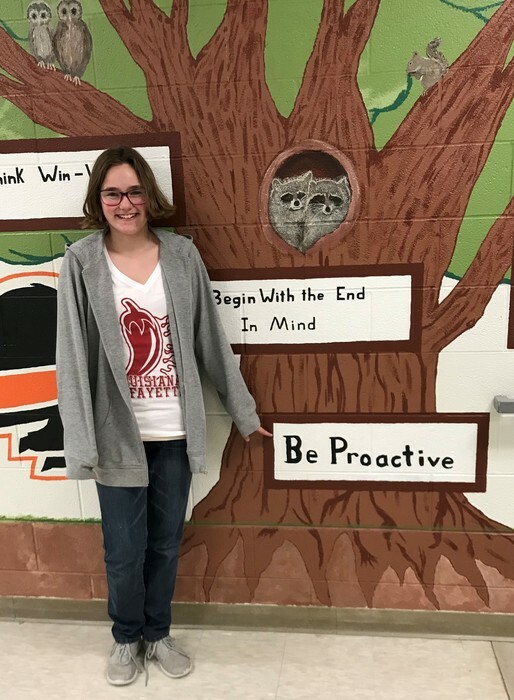 6th Grade Leader of the Week (1/14/19) Atalie Conger "I like Habit #4 Think Win-Win. I like this habit because everyone can win when you use this habit. I use this habit at home by finding a solution that works for my siblings and me." 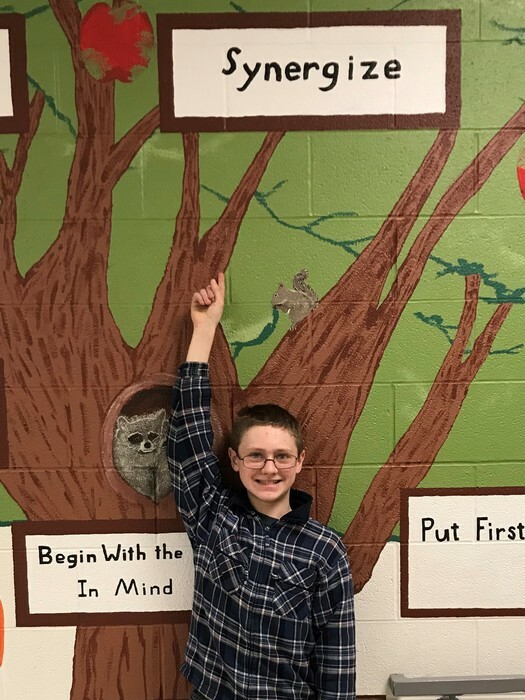 6th Grade Leader of the Week (1/14/19) Dylan Magnett "My favorite habit from the 7 Habits is Think Win-Win. 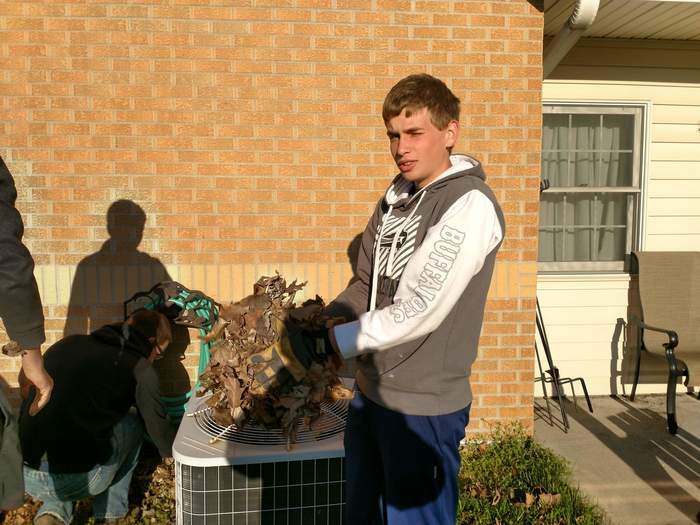 i like it because you are helping yourself and the community and/or your friends." 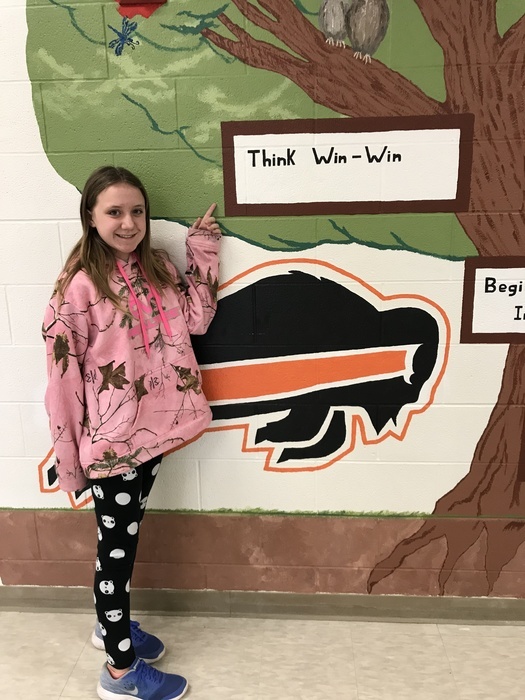 6th Grade Leader of the Week (1/7/19) Vanessa Koelling "I like Habit #7 Think Win-Win because we can all win! Whenever one of my friends need help with a paper I will help them! We will both win because my friend got help and I feel good that I helped them! 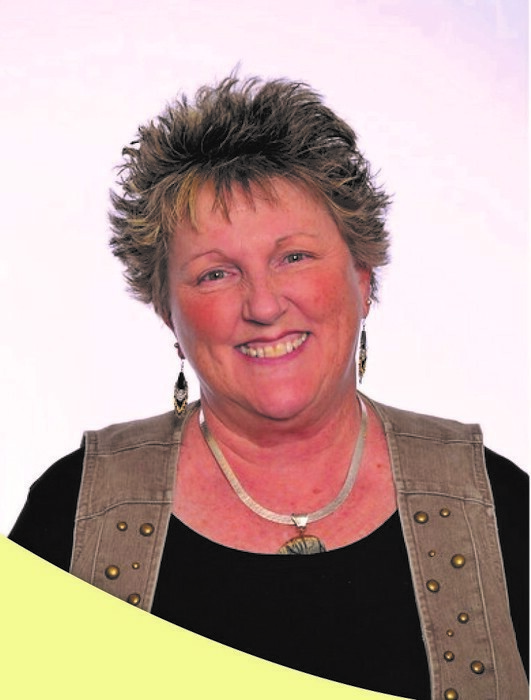 Rosie Bosse, a local author, will be visiting Onaga Elementary on February 15. Order forms are due February 4. 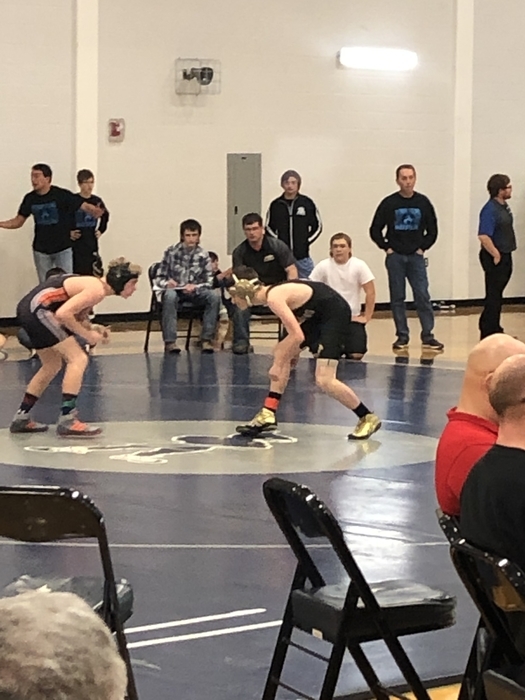 The Buffaloes did very well at the Atchison Wrestling Tournament this past weekend. 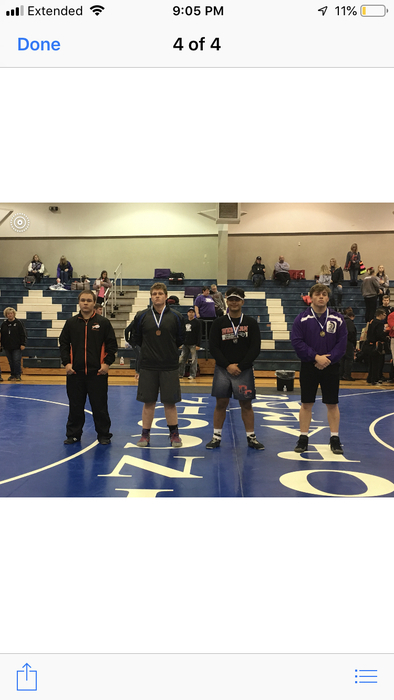 Kameron Henneberg took the gold and Trenton Cott took the silver. Tommy Kaberline took the bronze and Vincent Lara places 4th. Rylin and Morgan Mayginness both took 5th and Kaid Schwant took 6th place. This was a very strong showing. Congratulations! 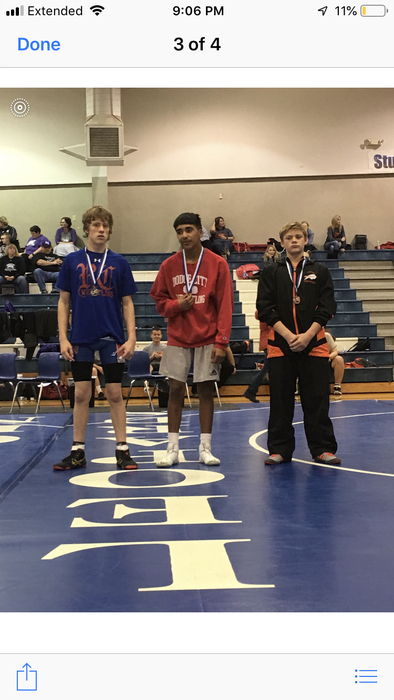 Looking forward to attending the Sabetha Wrestling Tournament Tuesday and seeing everyone compete their hardest. Lillie and Monty did an admirable job at the county competition today. USD 322 was well represented by our kids. Proud of both of you. 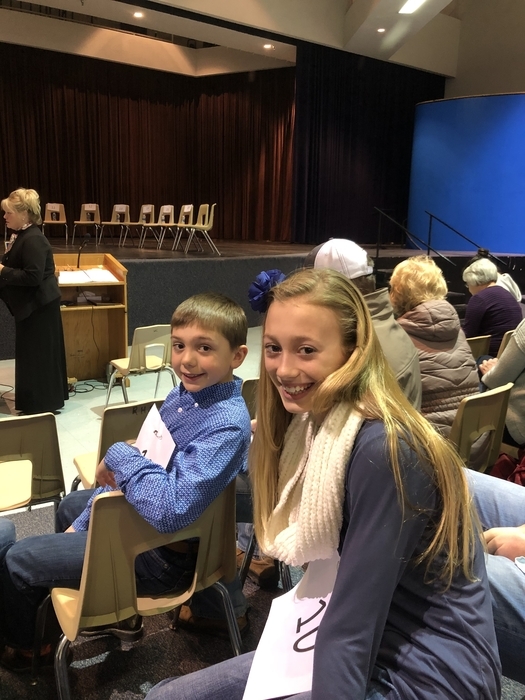 I’m now at the Pott County Bee to cheer on Lillie Weiser and Monty Meyerkorth from Onaga Grade School. Should be an exciting competition this morning. Good luck to Lillie and Monty! Still having the OTL Basketball Tournament games today. Just waiting for the power to be restored. Onaga Schools will start 2 hours later tomorrow morning - Friday, January 25th. No breakfast will be served. 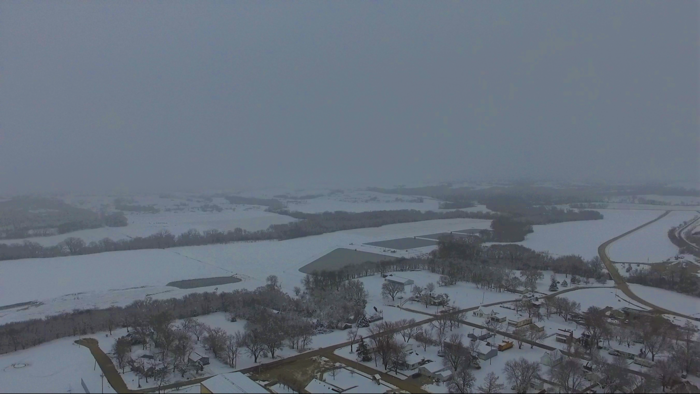 Onaga Schools will be dismissing at 12:30pm TODAY due to drifting roads. Due to the winter weather, Onaga Schools will be closed on Wednesday, January 23rd. The messy roads are making for longer bus routes this morning as we bring kids home. Thank you for your patience as our driver do their best to deliver them safely. Thank you! Temperatures are starting to freeze, so we are feeding students breakfast and sending them home like many other districts around us. Students will be released at 8:30am TODAY. If your stopping in at the school, come check out our leadership showcase! 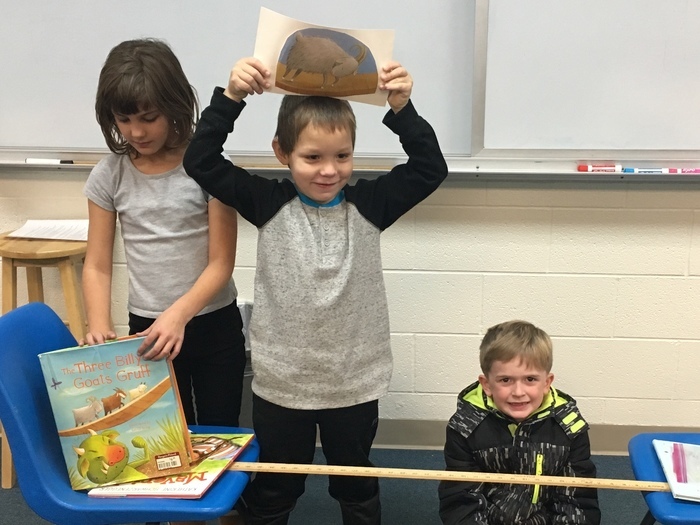 Grades pre-k through 6th have a student featured each week so we can learn more about them! We also feature staff members each week! It is at the south end of the building near Mrs Utley’s office!! Congratulations to junior Kady Figge who qualified for the state FFA competition by taking 2nd place in the NE Kansas FFA Speech/Job Interview meet. She competed in the Job Interview competition. 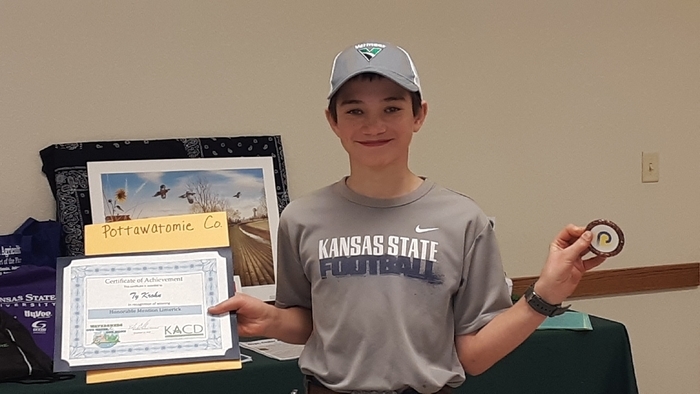 Freshman Joey Marten took 4th place in the Speech and Creed competitions. Congratulations to both Kady and Joey! 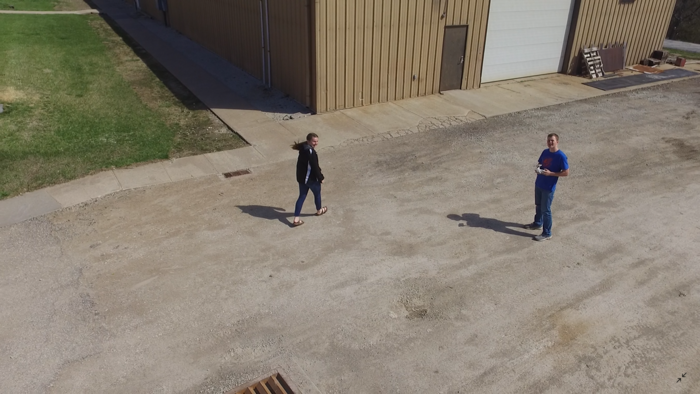 The Onaga High School Digital Media team met after school on January 9th to test out the school's drone. 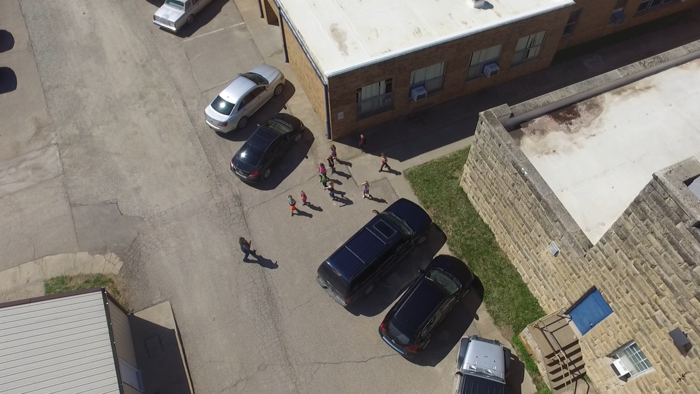 We took several photos using the drone of the USD 322 campus. 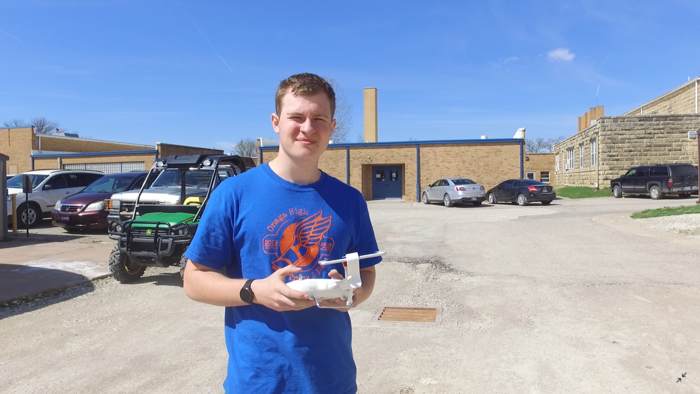 Ian Heit, lead for this project, helped teach other members of the class how to fly it. Posted by Clayton Szel. The January HS basketball game in Frankfort will be free to all USD 322 patrons. 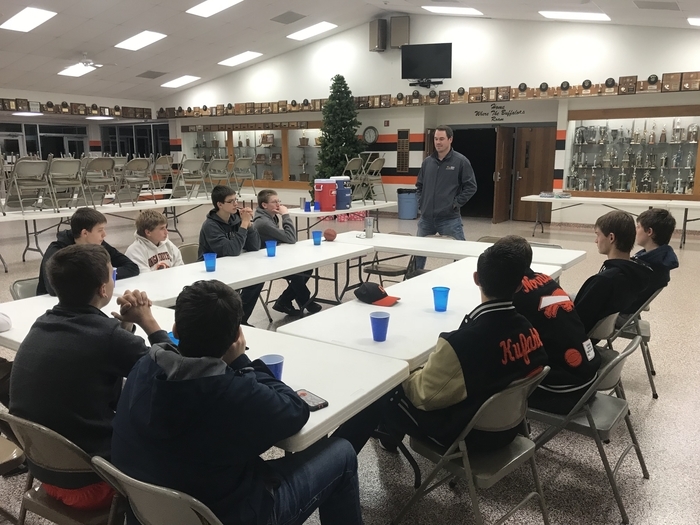 They appreciate the fact that the last 2 times they have come to Onaga for football, those have been the nights for a free meal from Farmer’s State Bank. It is a gesture that is a part of their community’s Donation Day. 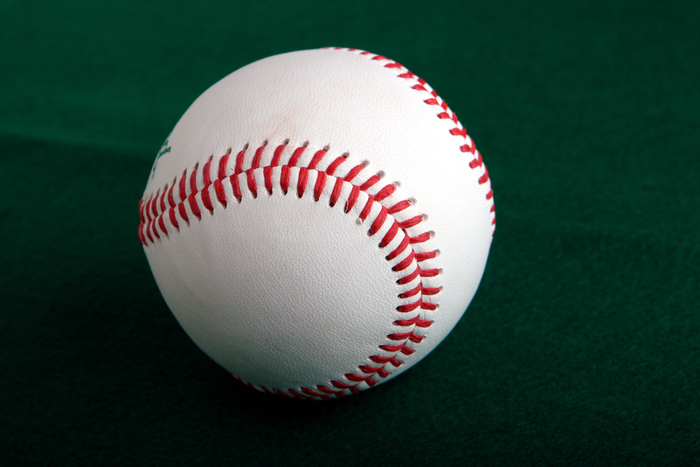 TVL Tournament games have been canceled today - Saturday , January 12. Updated game times for next week will be coming. 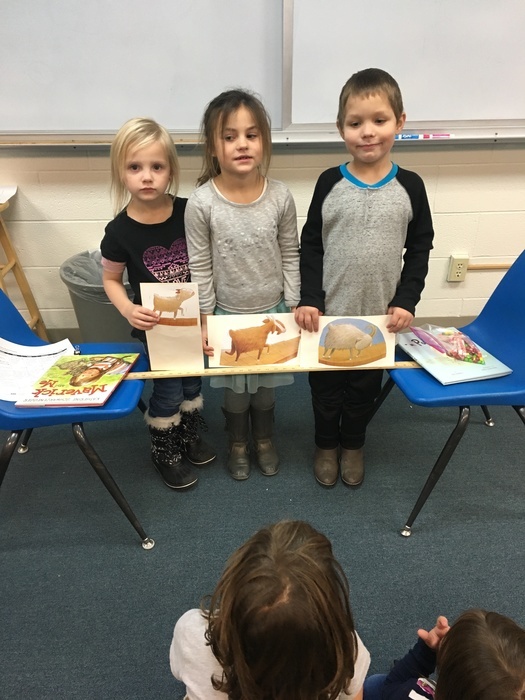 Preschooler Emery Weiser was our book leader today and read us a story during our read aloud time!! 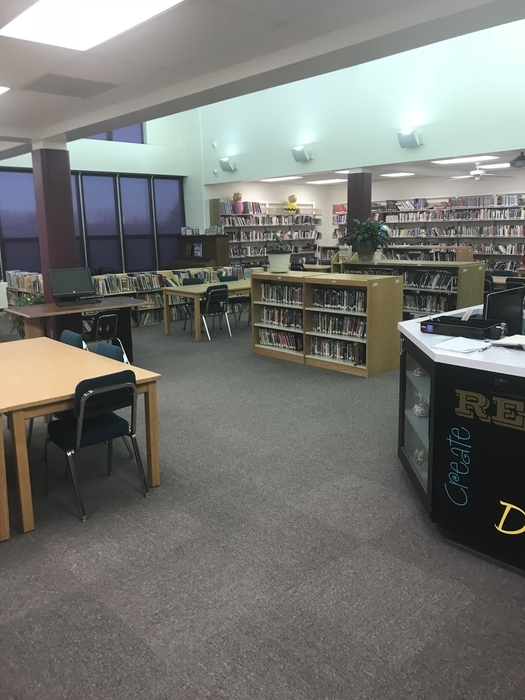 Library gets a new look over Christmas break. 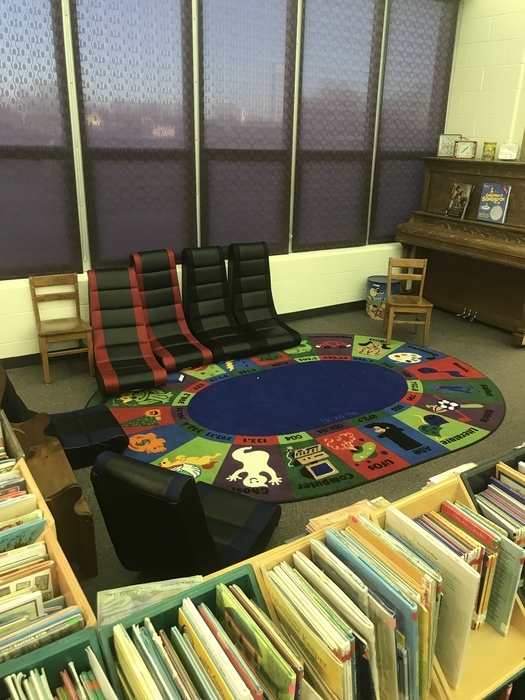 New reading areas and new arrangement greeted students and staff when they returned to school after their Christmas break. Great start to a new year at USD 322!! 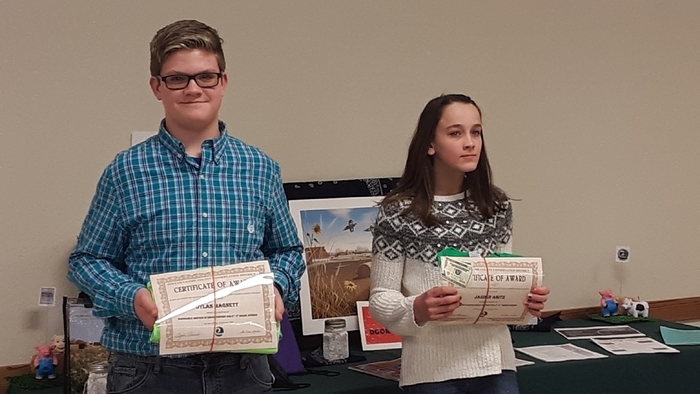 Onaga Grade School Spelling Bee is this Friday from 830-1030. All parents, relatives, siblings and all USD 322 patrons are welcome to attend. Spellers in grades 1-3 will have a mini-bee before the Spelling Bee. Spring LIFE session begins next Thursday, January 17. Still room for families to sign up! Enjoy a meal, playing with your child, and a family gift basket each night. 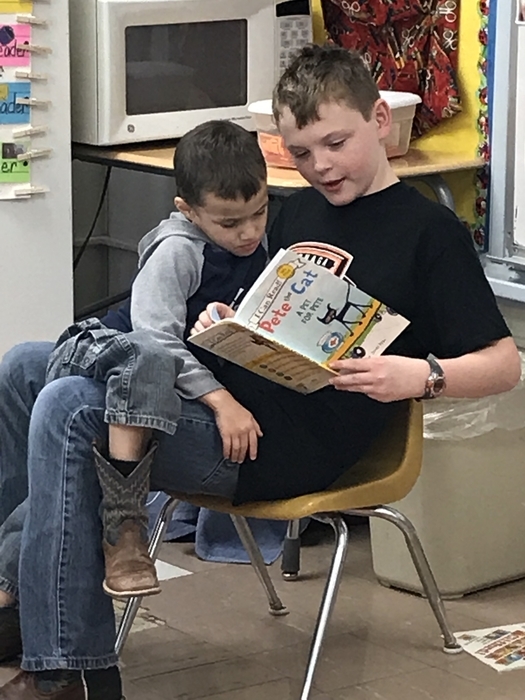 Learn to connect with your child and incorporate literacy in your home. Contact Christy Koelzer to sign up. 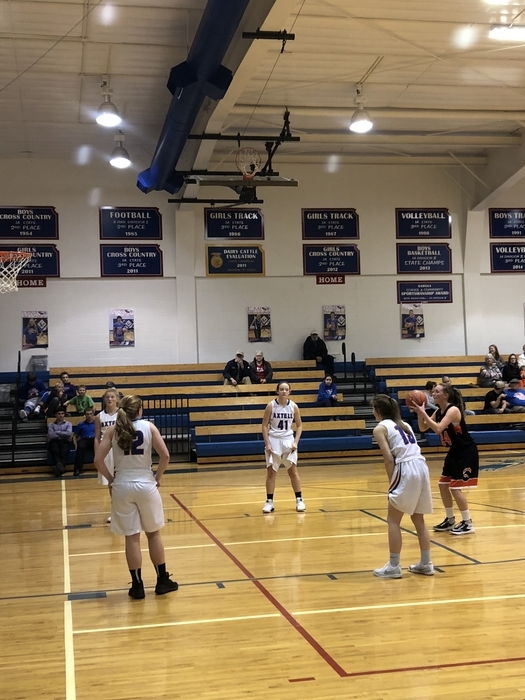 The JV girls basketball team defeated the Axtell Eagles Tuesday night. Way to go girls! Tough defense, timely shots, and free throws down the stretch made a huge impact on the outcome. 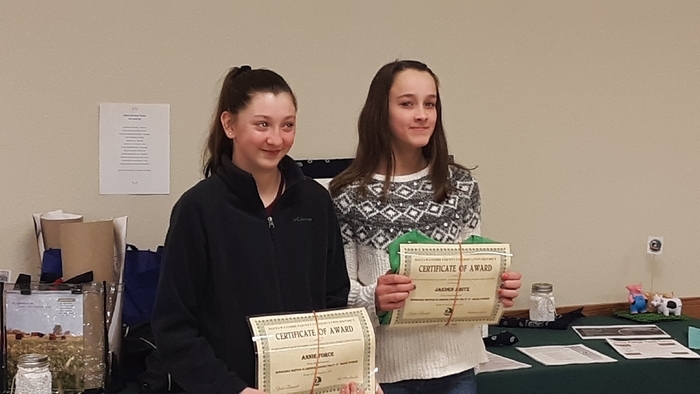 Onaga Chess Tournament Competitors- Both the K-5 team and K-12 team took home first place. 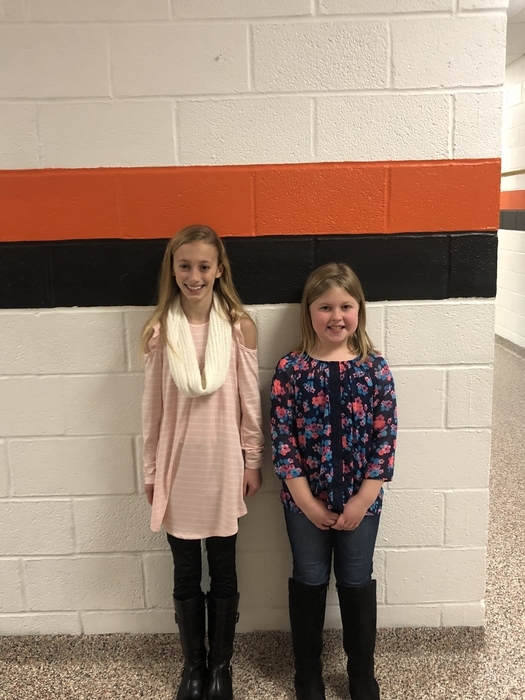 In the K-5 category, Lily Falk took 2nd place overall and Rebecca Peters took 3rd place overall. 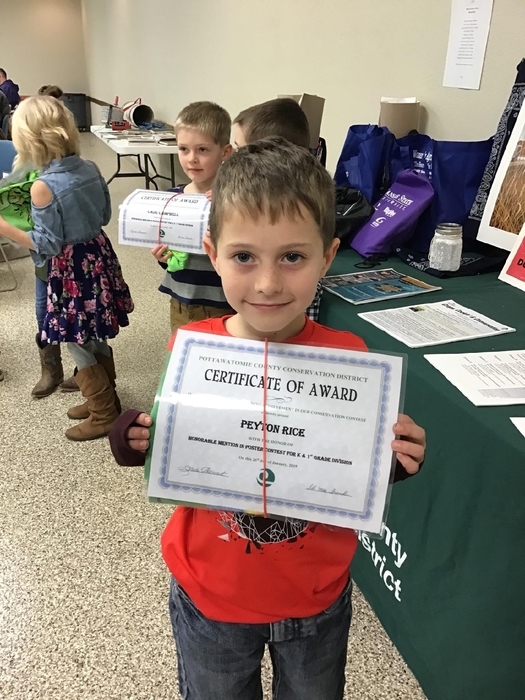 For the K-12 competition, Tyler Roggenkamp took 2nd, Peyton Wright took 4th, and Joey Marten took 7th. 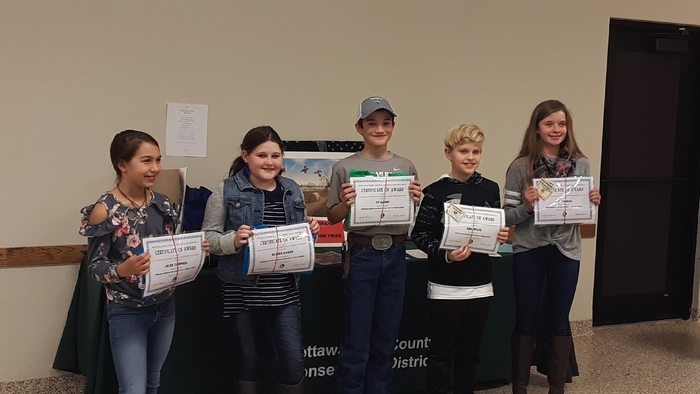 Our Onaga students competed with 5A and 6A students and did very well. 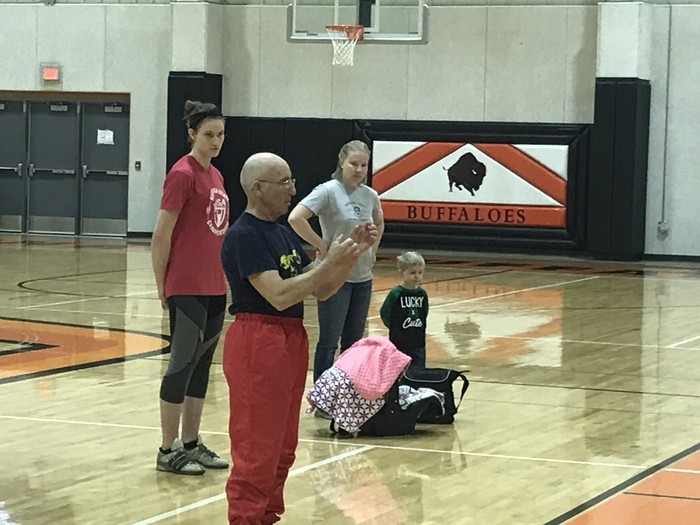 The Buffaloes are coached by Mr Daniel Goudy. Well done Buffaloes! 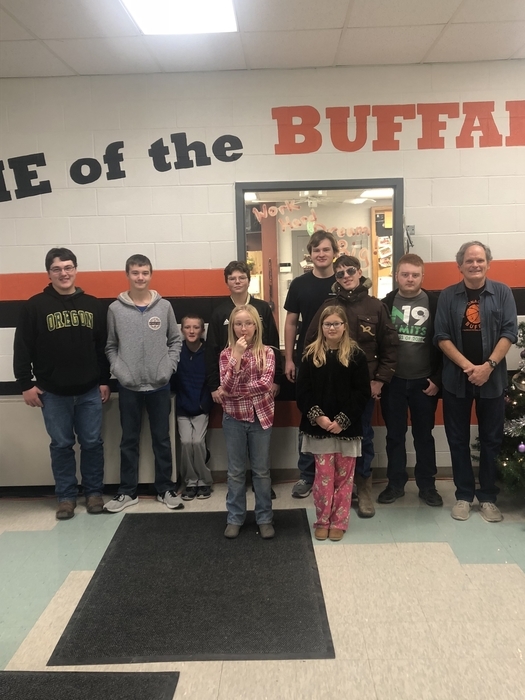 The Onaga Chess Club placed 1st in two divisions at the Onaga Chess Tournament held on December 15. Students in the photos are shown in pre-match practice. 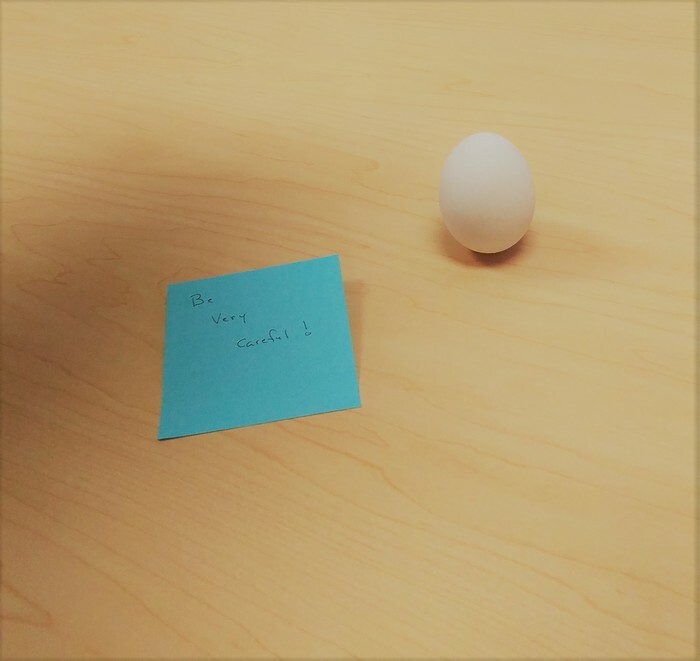 Posted by Ian Morris for the Digital Media Class. 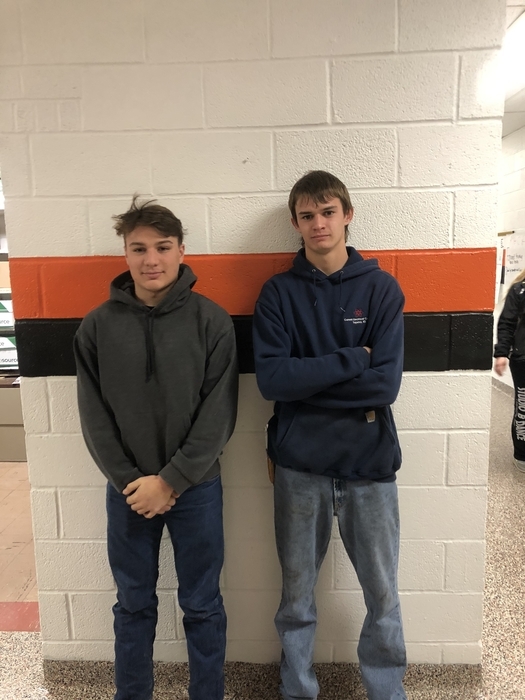 Morgan Mayginness took 1st place and Kaid Schwant took 2nd place at the Rossville Wrestling Tournament last Friday. Way to go! Onaga High School student Josh Marten shoots for 3 in a pre-game warm-up on Friday, December 14. In the next photo, Colby Myers takes a shot during the game against Hanover. 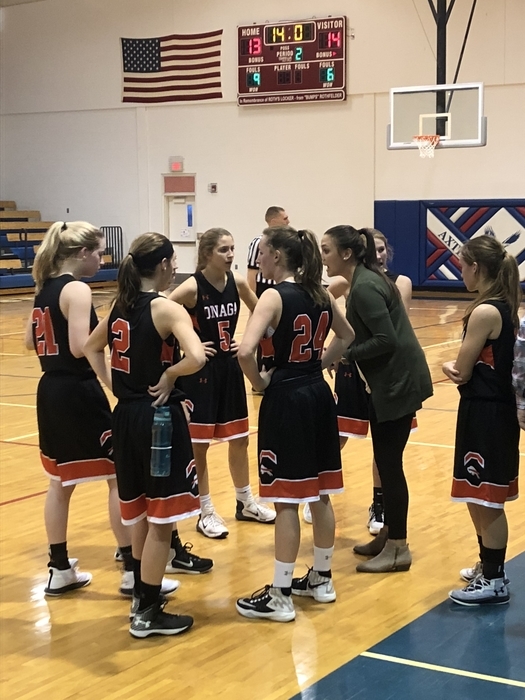 Although Onaga played hard, we lost 72-30. Posted by Parker Feagins for the Digital Media class. 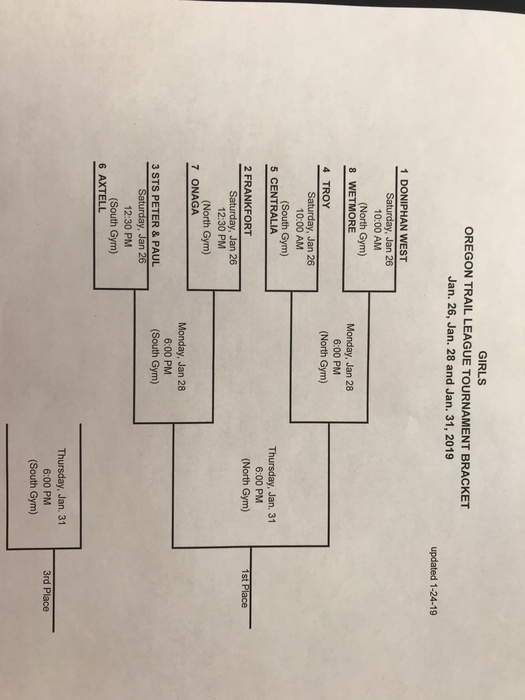 Onaga Jr. High Basketball @ Troy Monday, January 17, 2018 Starting @ 4:00 p.m. games will be played in one gym in the following order B-girls, B-boys, A-girls, A-boys. 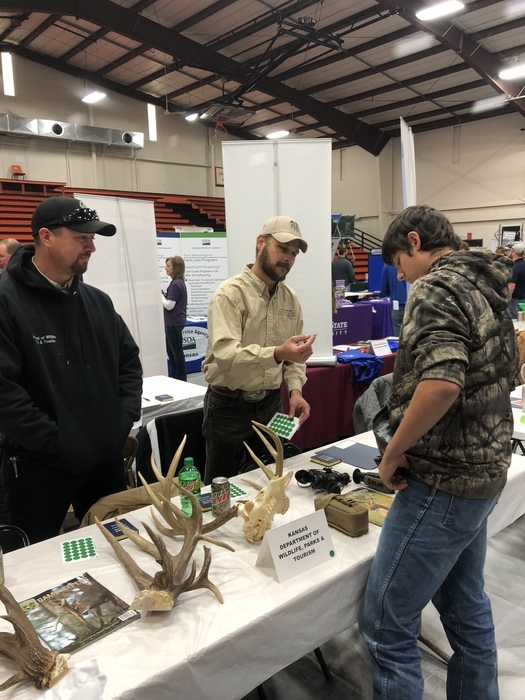 Those students that will be taking Highland Community College courses at Onaga starting in January can enroll now. If you are a first time student, see Mrs. Kocher to work through the admission process. All other students may log into their Highland account and enroll. 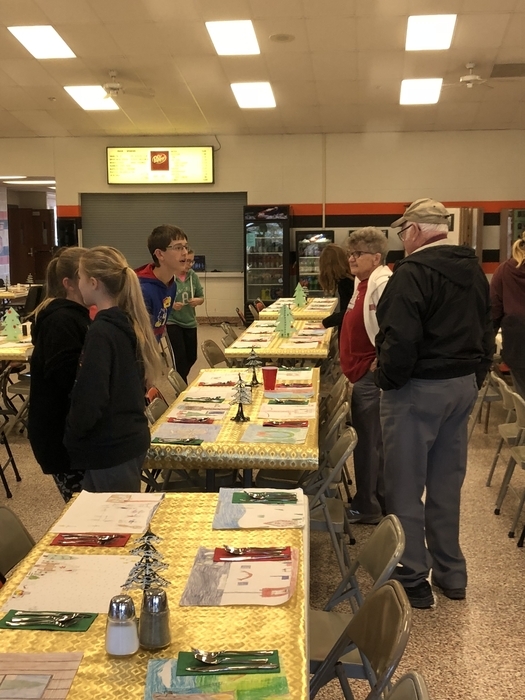 USD 322 held a Christmas dinner on December 12th. Our festive cooks made a delicious Christmas lunch for the students, staff, and parents. Even Santa photo bombed the picture! 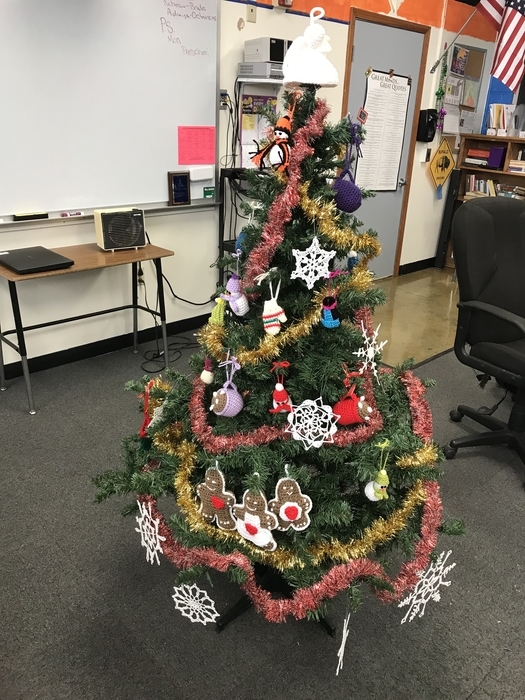 Posted by Clayton Szel for the Digital Media class. OHS Basketball - Friday, December 14, 2018 Game Times: 4:45 p.m. 1/2 J.V. Girls followed by 1/2 J.V. Boys 6:00 p.m. Varsity Girls followed by Varsity Boys All games will be played in the North gym. Due to a high number of flu and confirmed influenza cases in the Doniphan West school system they have cancelled school for the remainder of the week. Thus, the Jr. High basketball game scheduled for Thursday, December 13 @ D. West is cancelled. We will work with them to find a make-up date for this event. 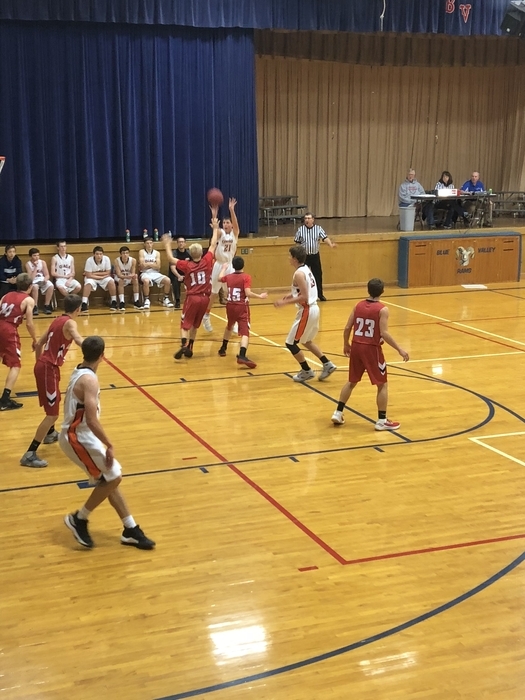 Tonight’s JH game schedule has been changed with Flint Hills Christian. The girls game has been canceled, and there will only be one boys game. Therefore, the boys game will begin at 6pm. There will be no gate charged for entry into this game. 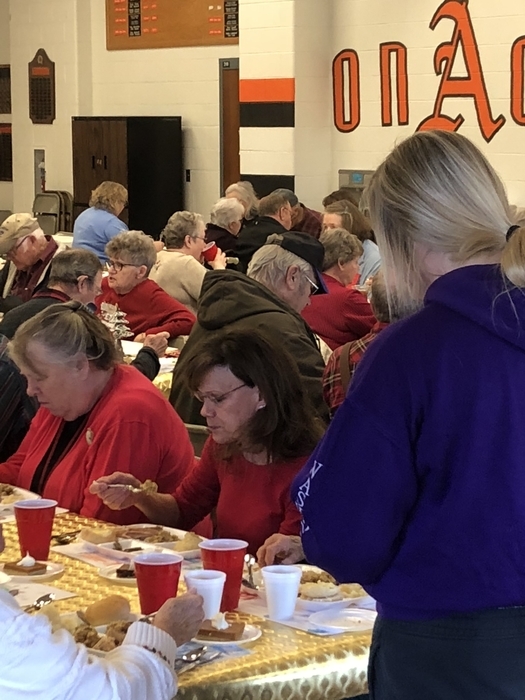 The USD 322 BOE and Farmers State Bank sponsored the Senior Citizen Christmas Luncheon on Wednesday. It was well attended. The HS Student Council members served and waited on our guests of honor. Big thank you to all who pitched in to make this happen. Good day to be a Buffalo!!! 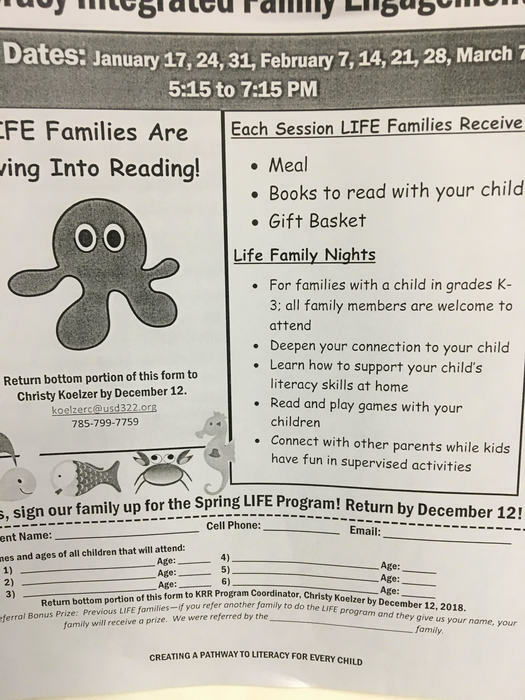 Enrollment for KRR Spring LIFE Program is now open for families with a student in grades K-3. Look for flyers/sign up sheets coming home today. Previous LIFE families: if you refer a family to join LIFE and they give us your name, your family will receive a special prize. KRR After School Program last day this semester is December 13. We will resume After School on our first day back from break on January 7. KC Koelzer launches a three from downtown against Wetmore today. 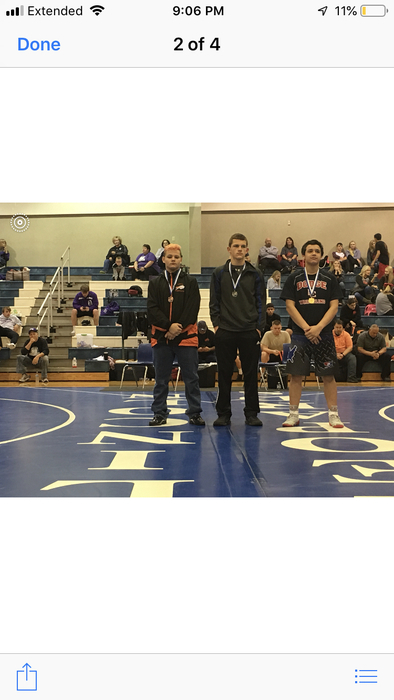 Results from Lincoln Wrestling Tournament today- Kaid Schwant, Rylin McGinness, and Morgan McGinness all took 3rd place today. 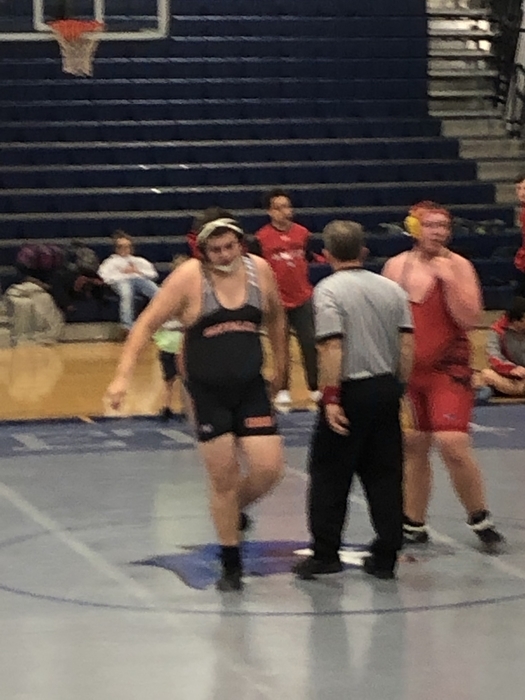 Kameron Henneberg took 4th. Good work today at your first tournament! OHS Boys were defeated by Wetmore, 36-67. The boys are 1-2 after 3 games. 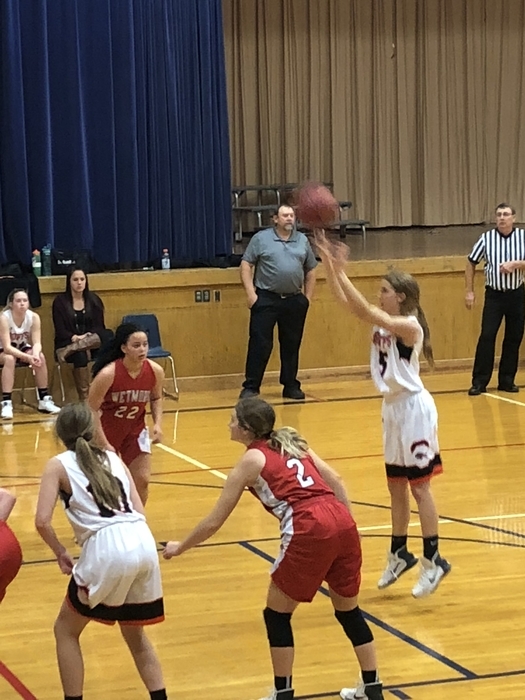 Chloe Fischer with a free throw attempt during the game against Wetmore today. The elementary classrooms are a little chilly, so please dress your children warm tomorrow. Mechanics will be there first thing in the morning to increase the heat output on the boiler. 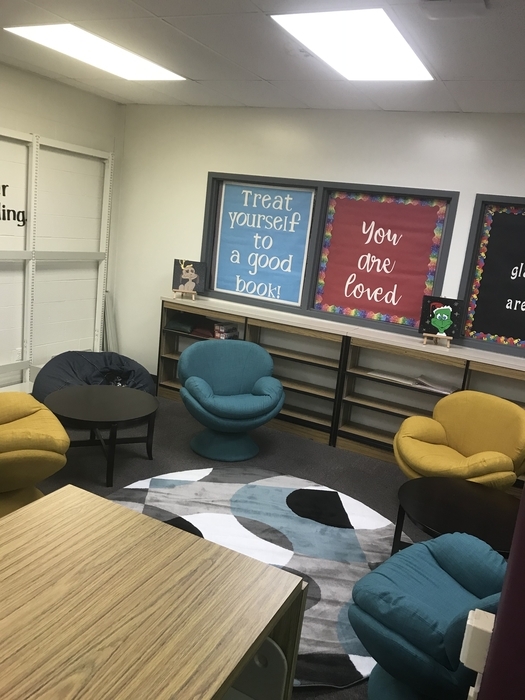 Teachers will move their class into a heated area of the building if their room is too chilly. 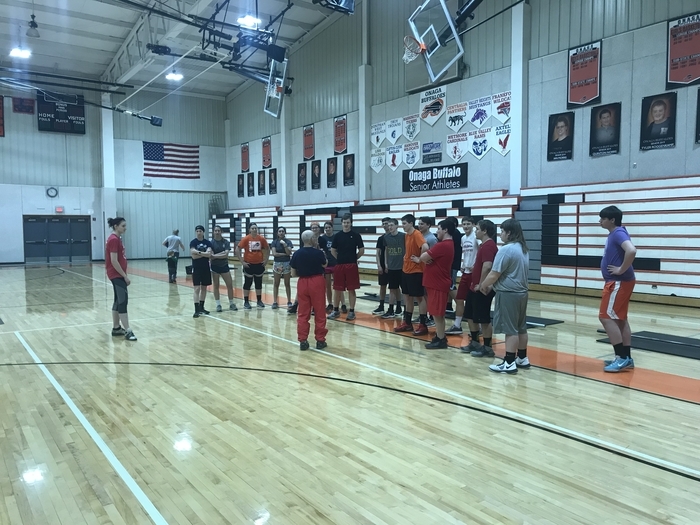 Onaga High Winter Sports Showing With the change in time and daylight comes the change in sports seasons for Onaga High. The high school teams will show off their winter sports teams with alumni scrimmages on Tuesday, November 27. 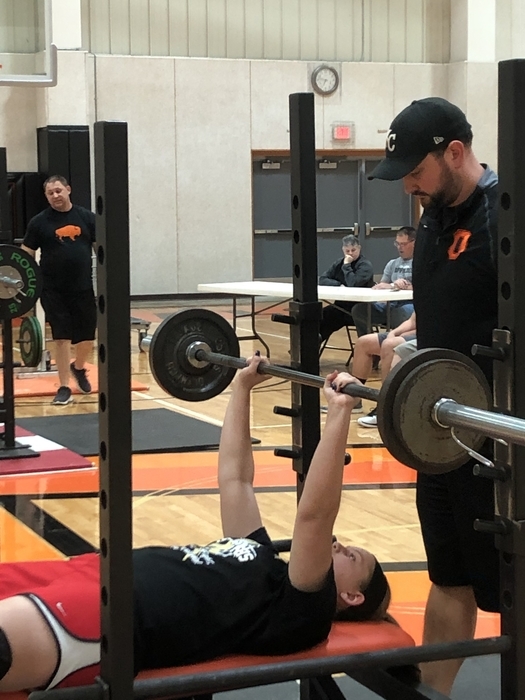 The evening will begin in the north gym at 5:30 p.m. with the OHS girls basketball followed by the OHS boys at approximately 6:45 p.m. Wrestling will debut as well with a 6:00 p.m. start time with matches taking place in the wrestling room. This year admission for this event will be a non-perishable item that will be donated to the local food pantry. 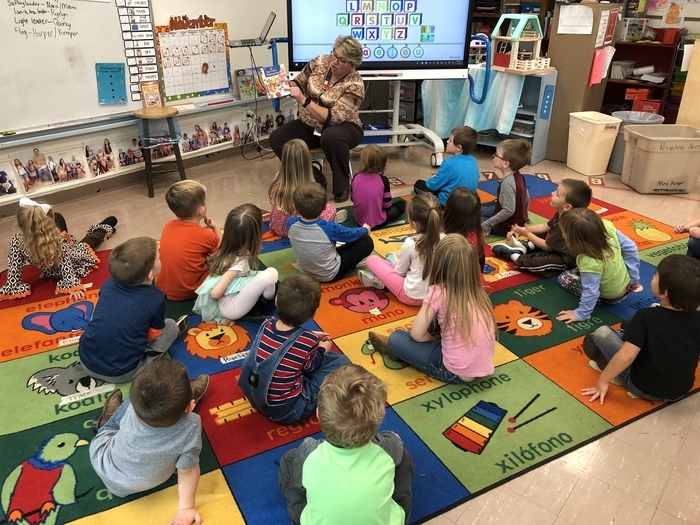 “Kansas Read to Preschooler Week” was last week and oh what fun we had with mystery readers the last week and a half. Here is just a few sneak peaks!! What a great week leading up to thanksgiving! We are definitely thankful for the support we have in our school!! Exclusive Handmade Christmas Ornaments! For sale at the Jr./Sr. High Music Chili Supper Fundraiser. 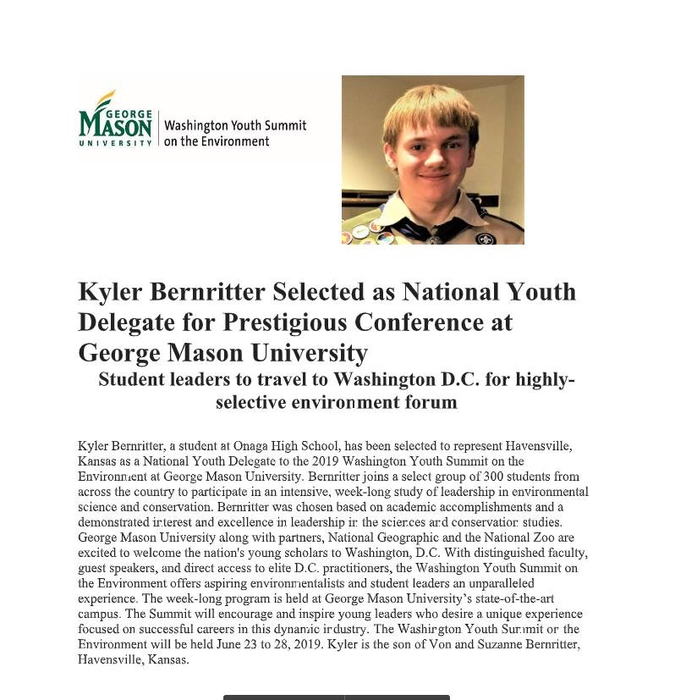 Tuesday, November 20, 4:45-6:15 in the High School Commons. All proceeds will go towards the Colorado Springs music trip. 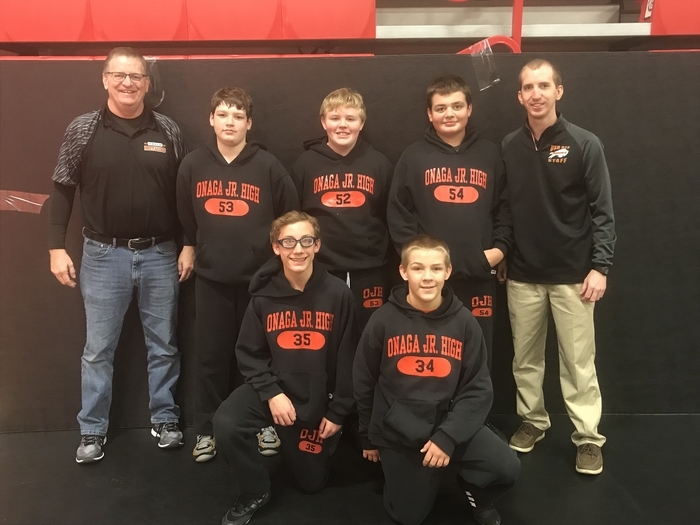 Onaga JH Wrestling ends the season on a high note! 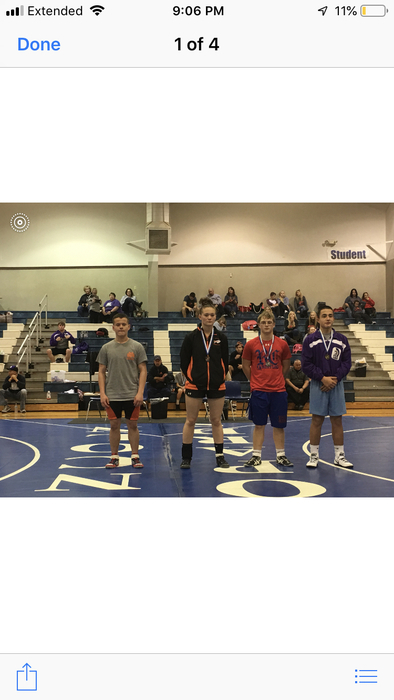 Landon 2nd, Christian 3rd, Christopher 3rd, Tatum 3rd, and Jeremia 5th. 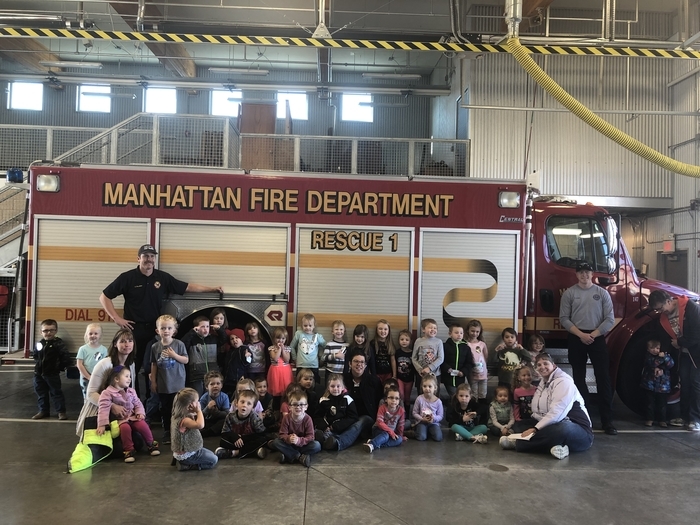 Preschool visited Manhattan Fire Station #3 today for a field trip to learn about how Clara and Norahs dad take care the Manhattan community! Thanks you Brian and Miranda Force for getting this all together!! 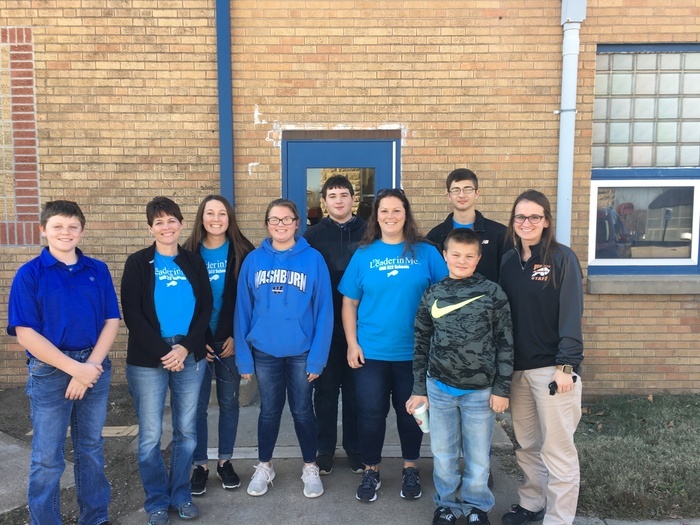 This group got to spend the day visiting Alma/Wabaunsee USD 329 area schools for their Leader In Me Discovery Day. 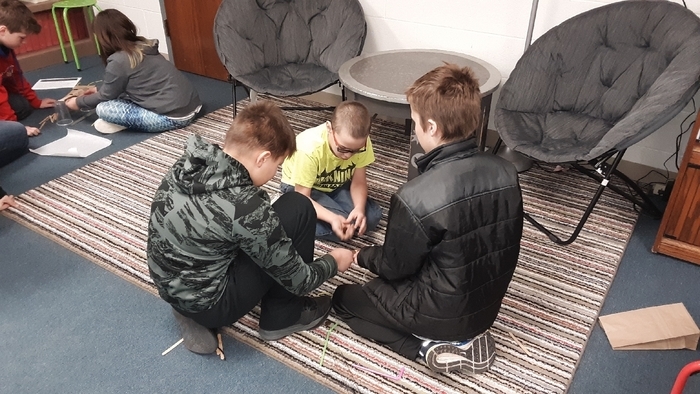 We came back with some fresh ideas and even more excitement towards the great things already happening with The Leader In Me here in Onaga! It was a great experience and we brought back a lot of good information! 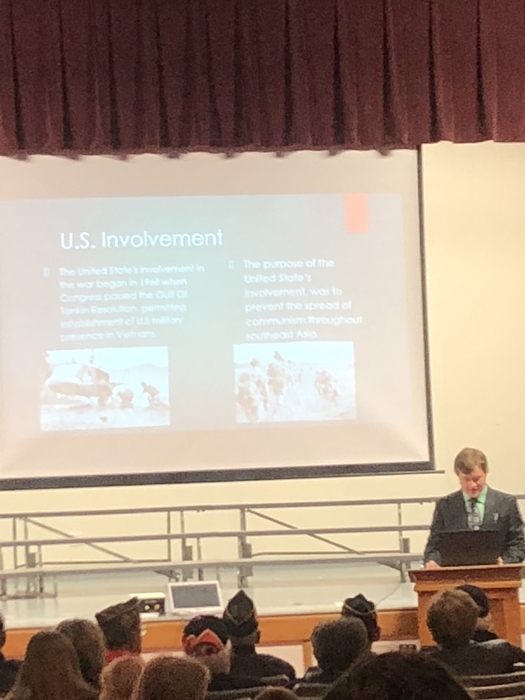 Senior and future Air Force member, Ian Heit, speaks to the packed auditorium crowd about the history of the Vietnam War during the Veteran’s Day program on Monday. We were honored to be joined by many local vets who served for our country to protect our freedoms and democracy. Our senior class put on the program and involved other grade levels as well. Well done seniors and Mr Kufahl! Thank you. A little late with this but USD 322 had two seniors selected by the KU Endowment Association as Kansas Honor Scholars. 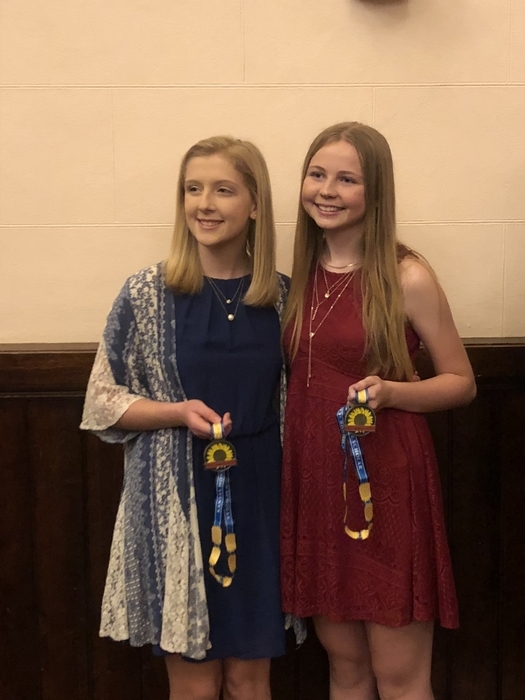 Tess Fairbanks and Emily Ronnebaum were honored at a ceremony and reception held at Topeka West. Congrats girls on this tremendous honor! 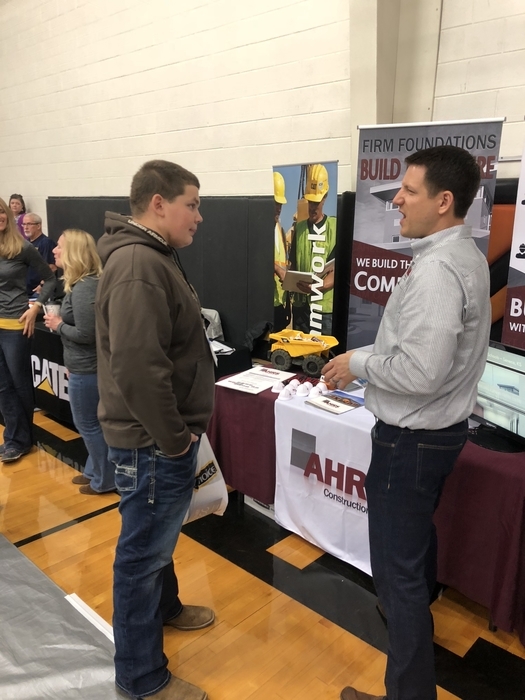 Our juniors spent the morning of Nov 8 participating at the area Career Fair in Centralia. Can’t wait to see what our talented kids do in their future endeavors beyond high school. Go Buffs! Huge turnout for the famous Thanksgiving feast prepared by the state’s best nutrition team! Thank you ladies- it was delicious. 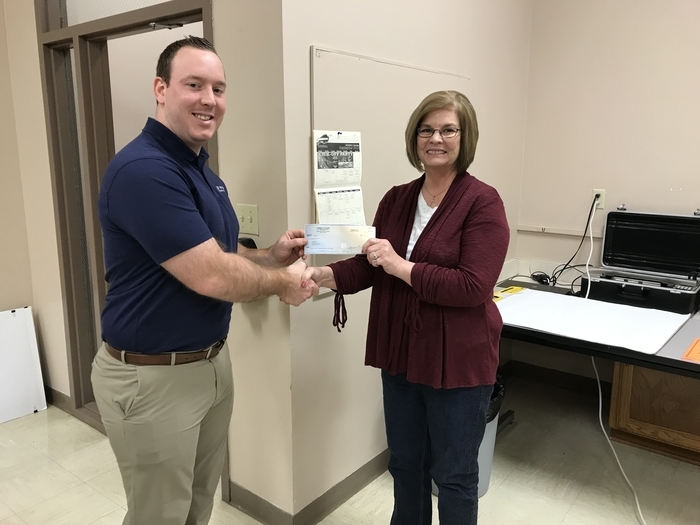 Thelma Linck receives $1000.00 Cash for Teachers award from Farmers State Bank. 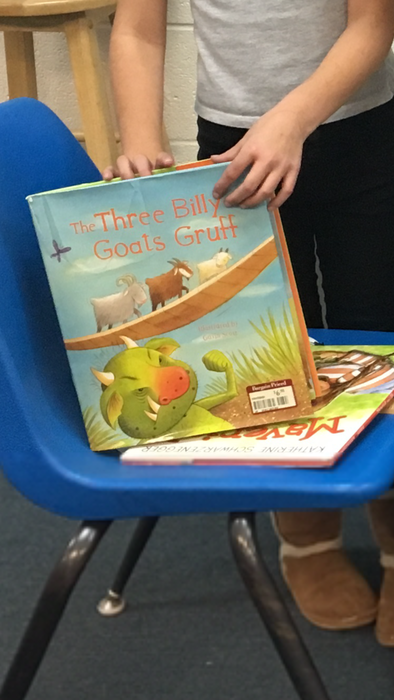 KRR SRA-V group took turns putting on The Three Billy Goat’s Gruff play after Mrs. Kolterman’s read aloud....we have so much fun learning together! Parents of 3rd-6th grade boys and girls please get Frankfort basketball forms turned into Mrs. Sperber by Wednesday. Thank you! Since there is no school today, we will not be having the Girl Scout recruiting night tonight. We will hope to reschedule it for next Friday, November 16. Please look for further information later. Due to the boiler not fixed and the cold overnight temperatures, USD 322 will be closed tomorrow. NO SCHOOL for Friday, November 9th. 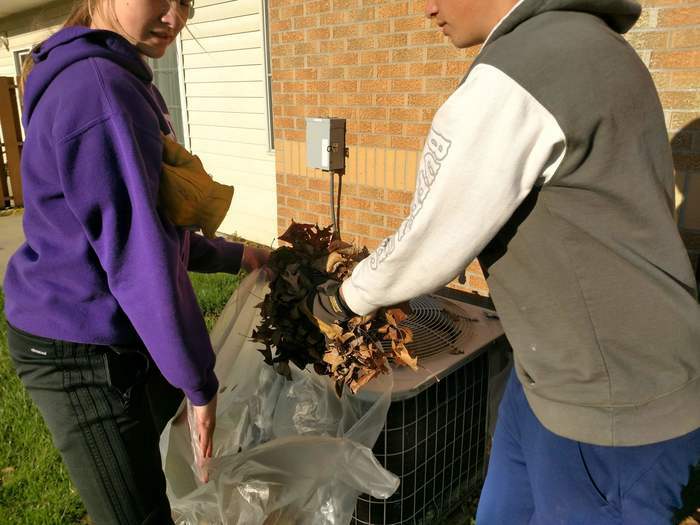 The boiler will be fixed this weekend and the building warm by Monday morning. If all of the snowflakes were lemon drops and gum drops oh what a world this would be! 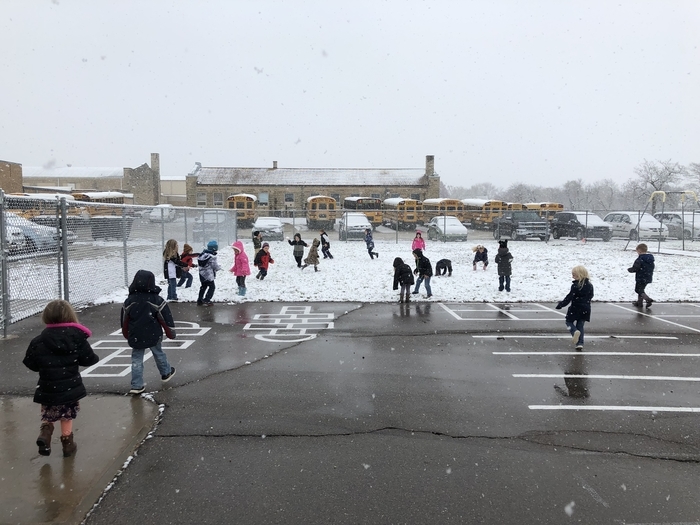 !🎼🎤🎸 preschool having fun in the snow! Mystery Story Walks: The 8th and 10th grade English classes went on a Story Walk just before Halloween. They are now taking their observations and writing mystery stories. Can't wait to read their adventures. Due to the weather forecast, there will be NO KRR After School Program and NO LIFE Program today. Tonight's LIFE session is rescheduled to Tuesday, November 13. USD 322 staff took part in county preferred ALICE Training yesterday. 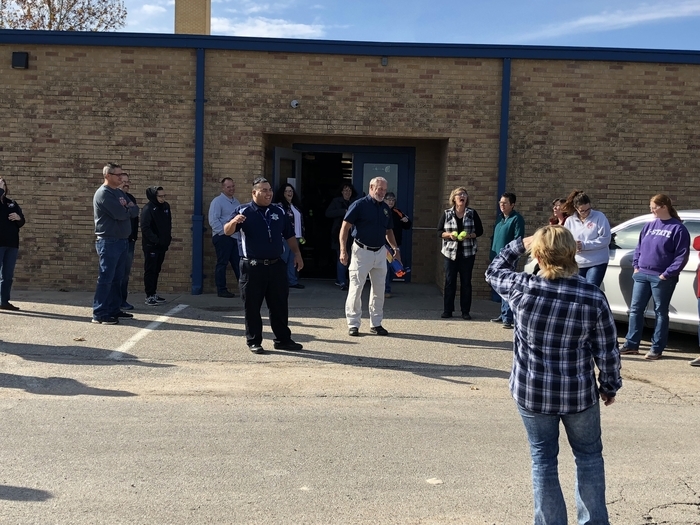 ALICE (Alert, Lockdown, Inform, Counter, Evacuate) Training provides preparation and a plan for individuals and organizations on how to more proactively handle the threat of an aggressive intruder or active shooter. ALICE is the leading training solution that increases an organization's and individual's odds of survival during a violent intruder event. ALICE is a strategy that goes beyond the conventional lockdown. We are so thankful for your children! 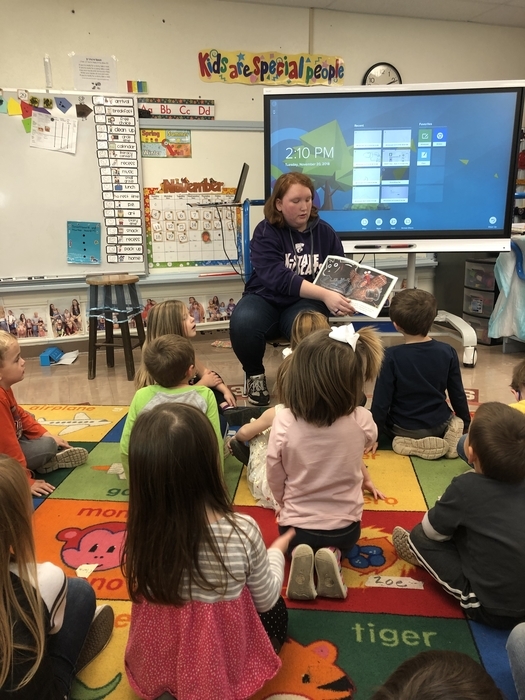 Had a great day learning about community helpers in OUR community at preschool!! The boiler heating the 7-12 classrooms will hopefully be up and running by the end of the week. Until then, 7-12 classes will be relocated to warm areas of the building. Welcome to the Library, we have a book for you. So excited for our cooks delicious Thanksgiving Dinner on Wednesday!!! Can't wait for the delicious Thanksgiving dinner on Wednesday, November 14. 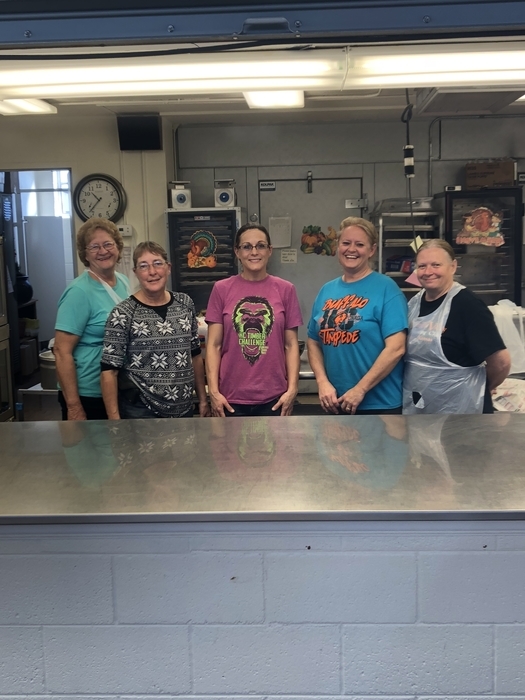 Onaga school kitchen staff are awesome. Taking center stage! The Buffalo's are BACK! Being a teacher means being a lifelong learner. USD 322 teachers are being active learners today! 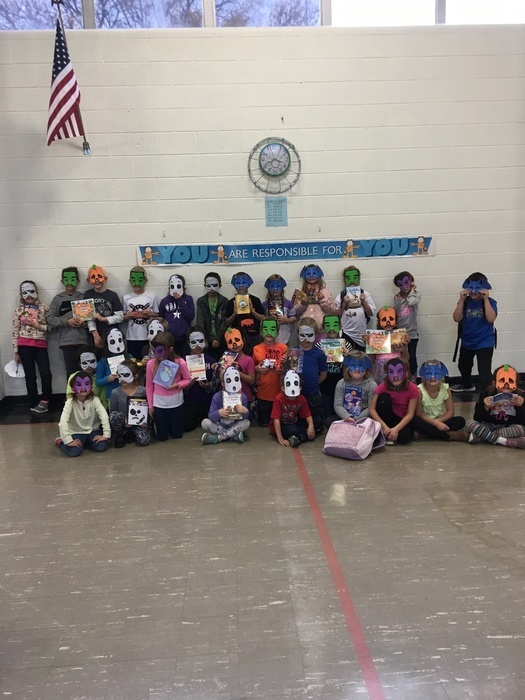 After School students with their October attendance award books (and a little Halloween fun). Our Accounting Class daily joke from yesterday: "What is an accountant's favorite brand of cereal?" Post. Mrs. Harris's class has been busy writing Opinion Paragraphs about their favorite season. 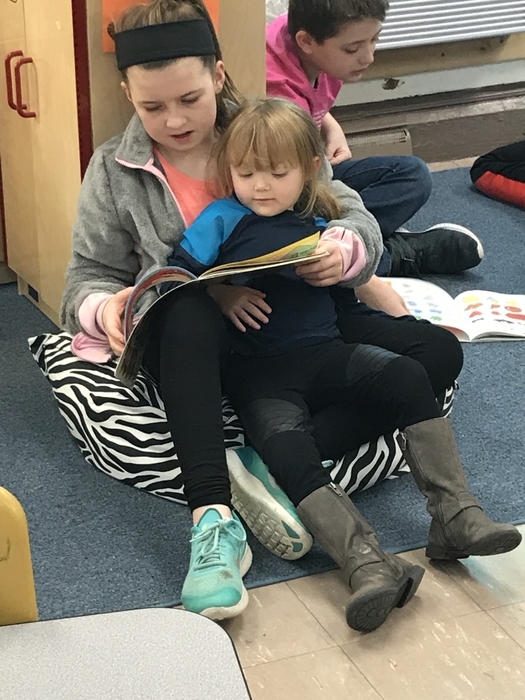 Pepper enjoys having the students read to her each day. The most favorite dessert in the math classes at OHS is pumpkin pi. 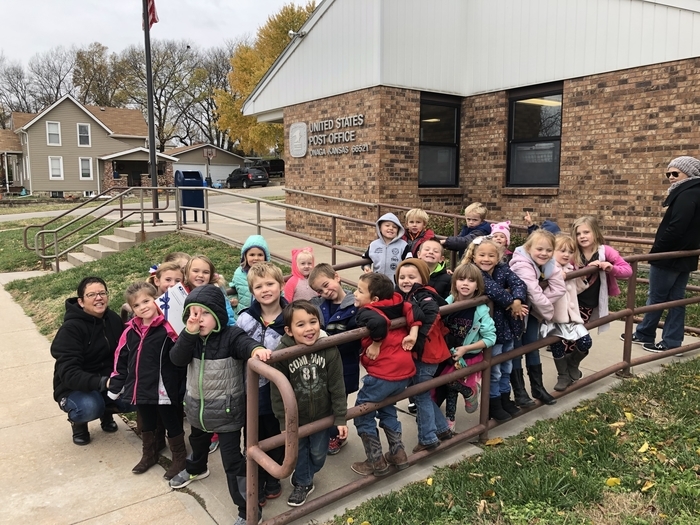 Love pre-school field trips around our town of Onaga!! 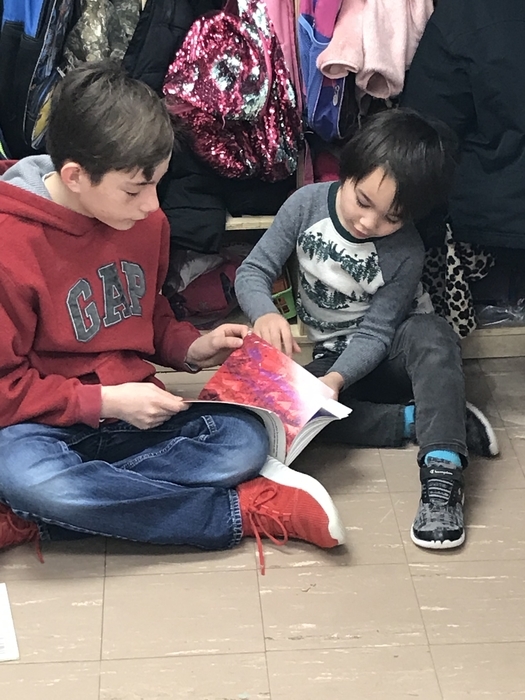 Thank you to our sixth grade buddies for coming to read to kindergarten yesterday! 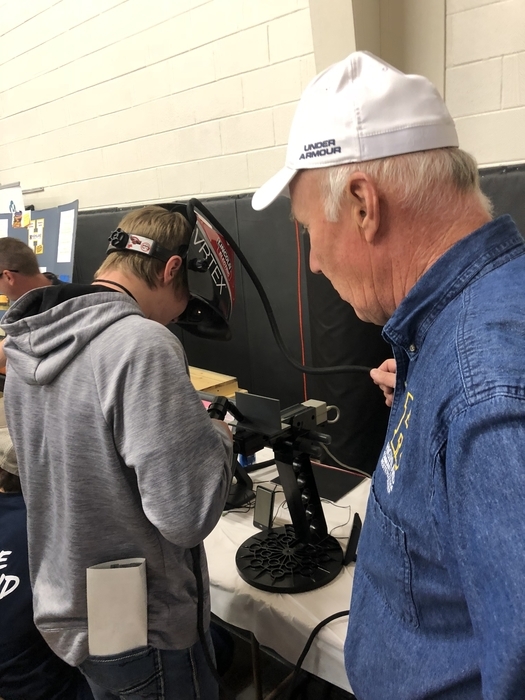 Great things happening in USD 322! A big thank you to Brandi Wesley for all the work you did while an elementary special ed. para. Good luck to you in the new chapter of your life! 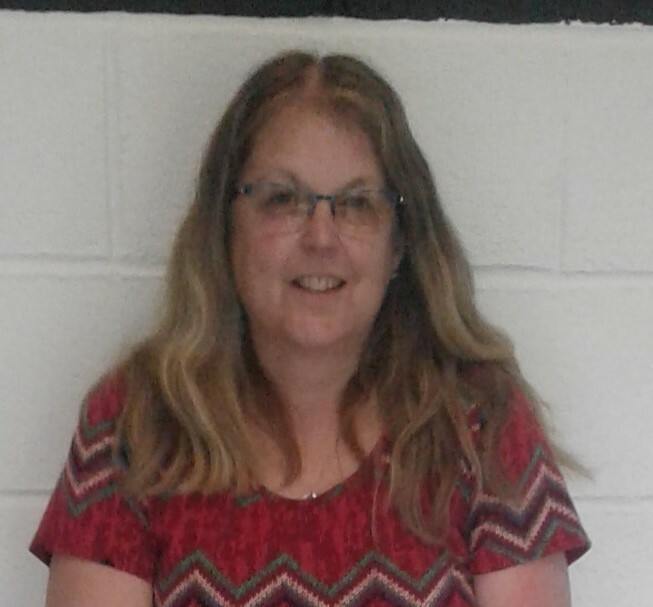 In looking forward to our new staff member -- A great big welcome to Sherri Brunkow as you begin your new (and returning) adventure as an elementary special ed. para. 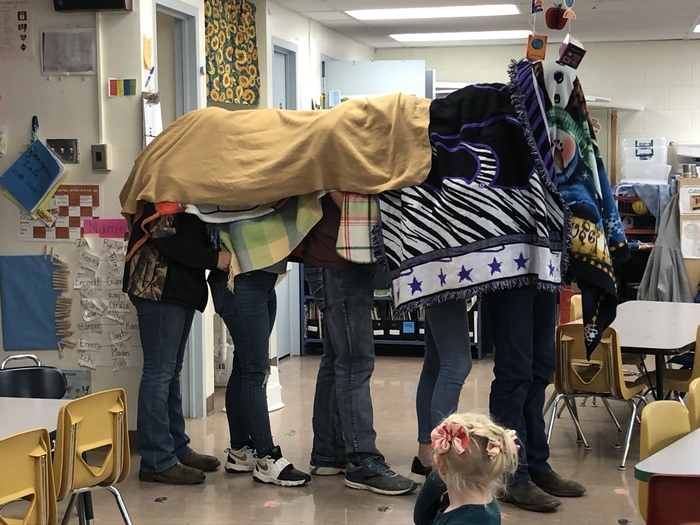 Onaga Grade School Teachers make a great team! 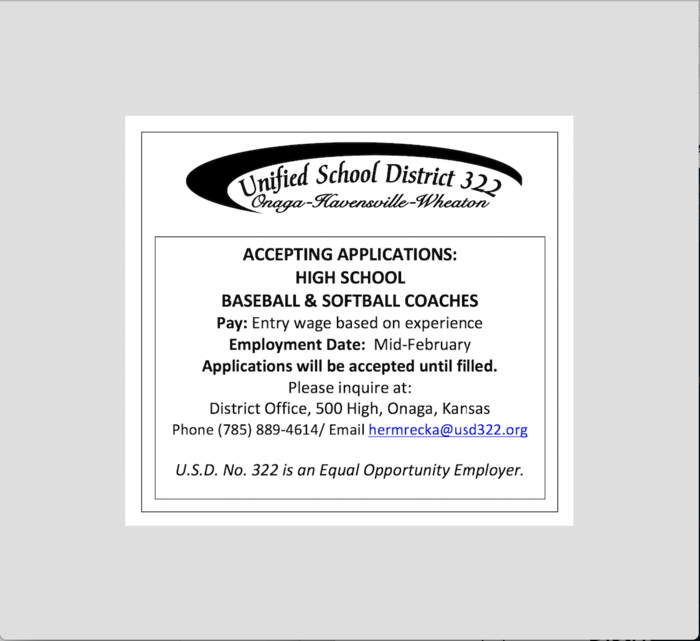 USD 322 is the place for me!! 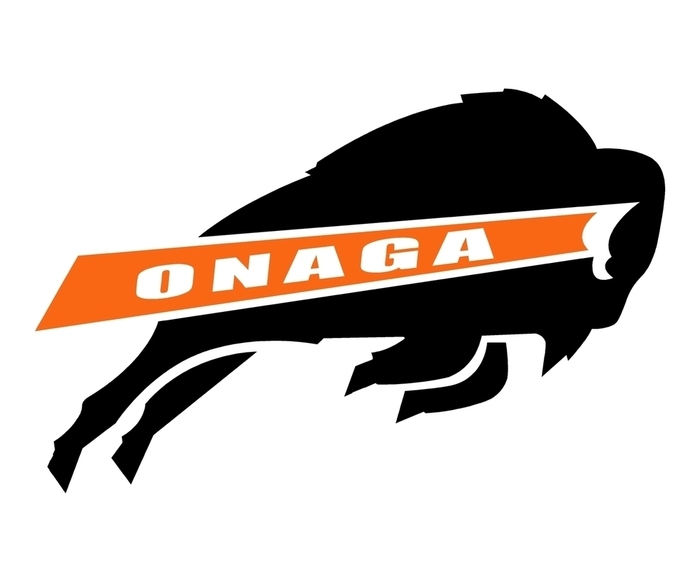 Onaga Buffaloes make me PROUD!! Have a great day USD 322 Staff! 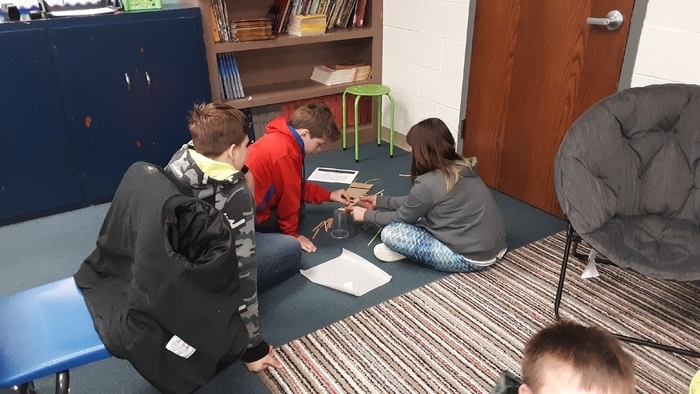 Fifth graders are wonderful learners! Great day for training at USD322! Good luck today with your job shadow Jewel F, Morgan M, Morgan W, and Halie J! OJHS / OHS Buffaloes are #1! USD 322 received ALICE training today. 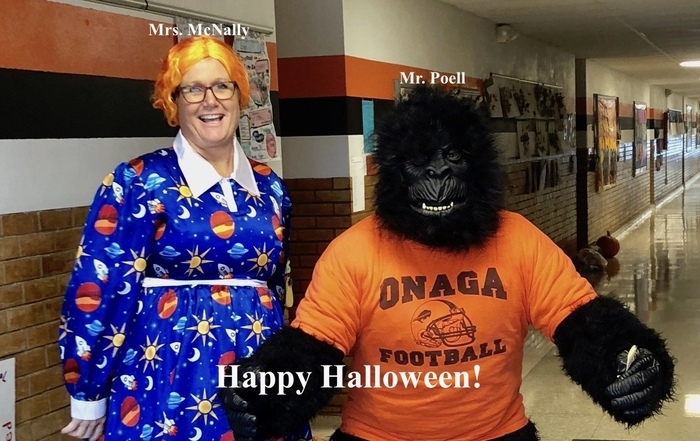 Mrs. McNally and Mr. Poell showing off their costumes! 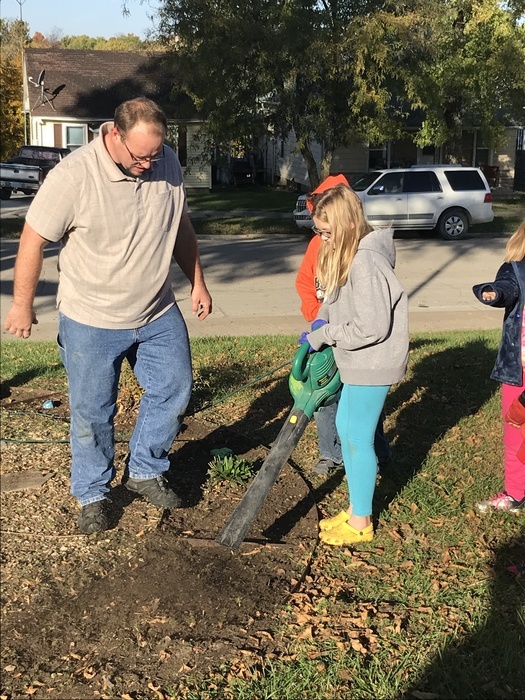 Students and staff of USD 322 did a wonderful job during their first Leader in Me Community Service Day. 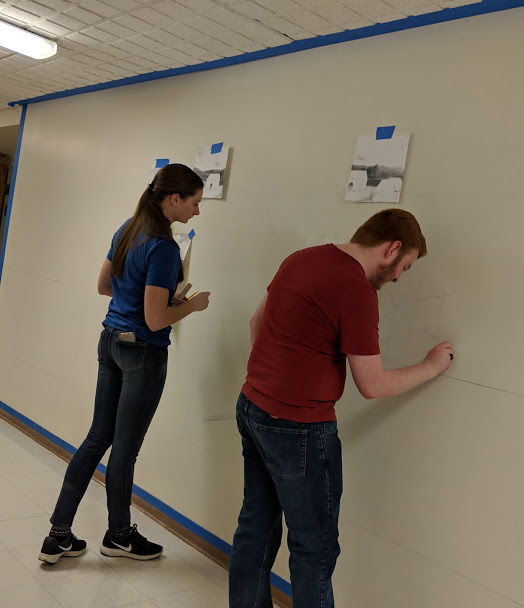 It was amazing to see how hard students and staff worked, how they understood the importance of giving back to our communities, and how much they accomplished in one day. 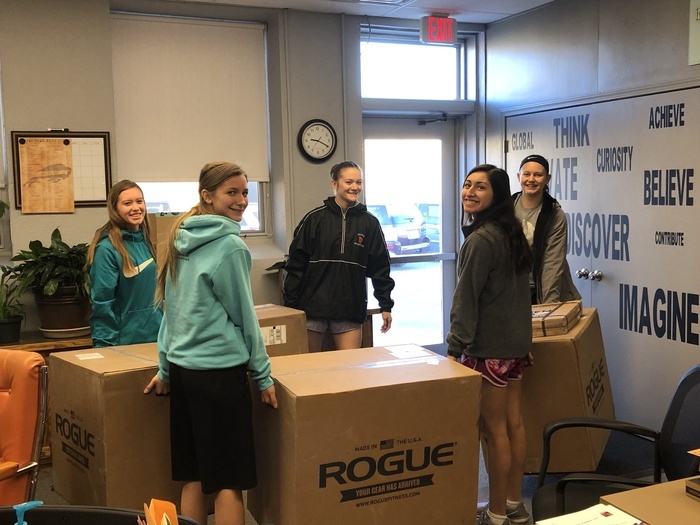 Our next Leader in Me Community Service Day will be on May 1st, and we hope to service many more areas within our communities of Wheaton, Havensville, and Onaga. Also, be sure to check out our new app!